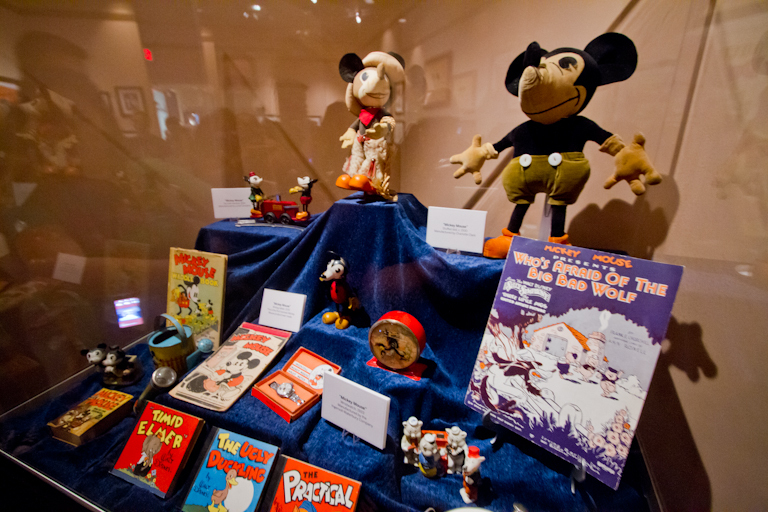 There's nothing like waiting until the last minute to visit the Treasures of the Walt Disney Archives exhibit at the Ronald Reagan Library just outside Los Angeles. 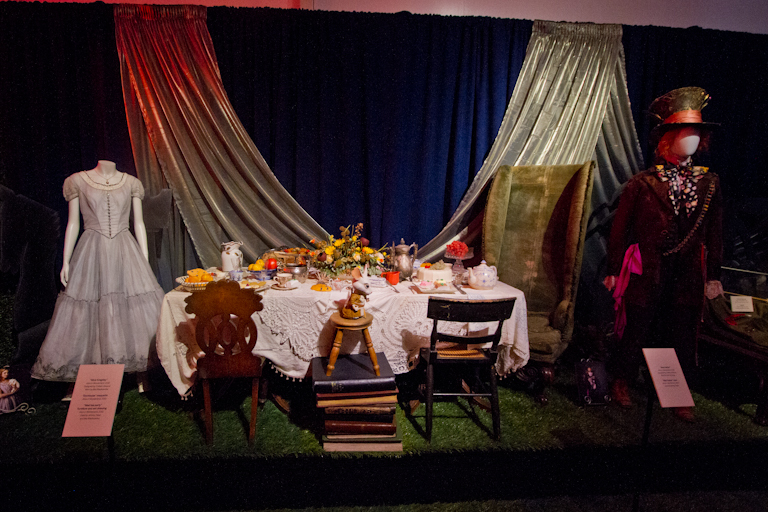 The exhibit has been there since July 6th, 2012 and would be leaving April 30th, 2013. Well, after talking to the Club 33 member the day before, they convinced us that we should visit before it's gone. That only left Sunday for us to see it before it's gone forever. Jacob, Theresa and I carpooled together and we all met Ruston up there. Here we're waiting for Ruston to arrive. Even though we live about an hour apart, we arrived within 5 minutes of each other. Unfortunately we don't have a lot of time together. Ruston has to split at 3pm, and we didn't arrive at the museum until 11:30am. 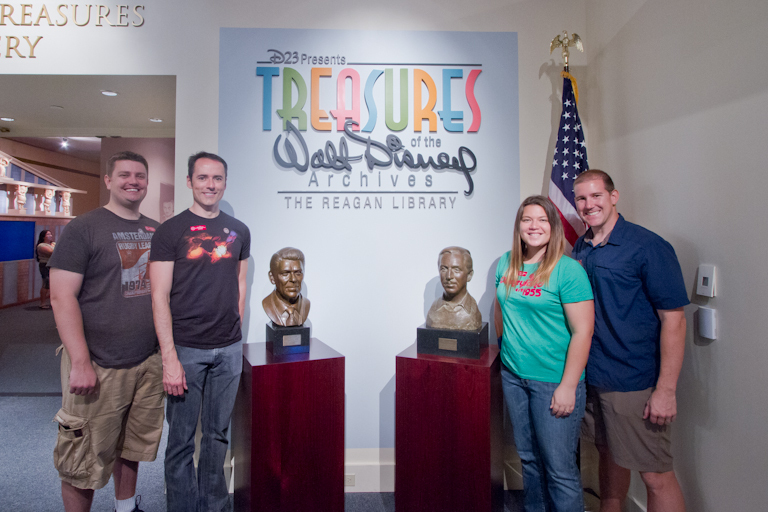 Since the Reagan Library will be here whenever we want, we decided to focus on our main interest, Walt Disney! 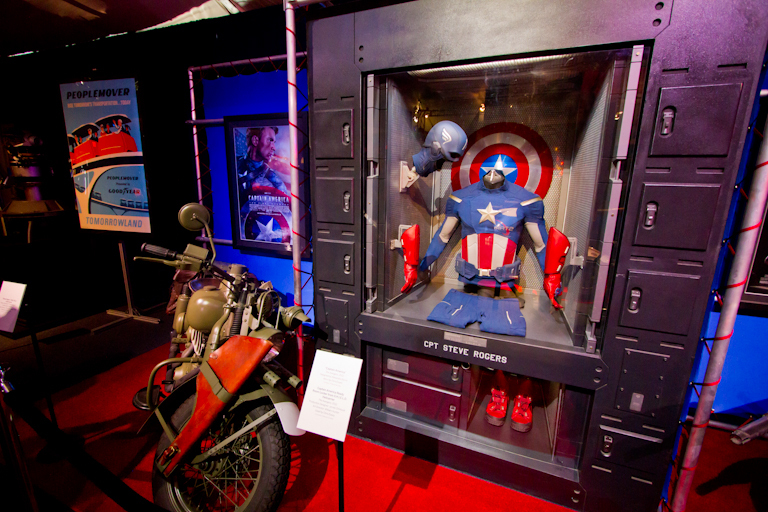 Entrance to the Reagan Library is $15 and then the special Disney exhibit is an additional $6. We're ready to go explore! I've heard nothing but good things about all the items we're going to see, so I'm excited! 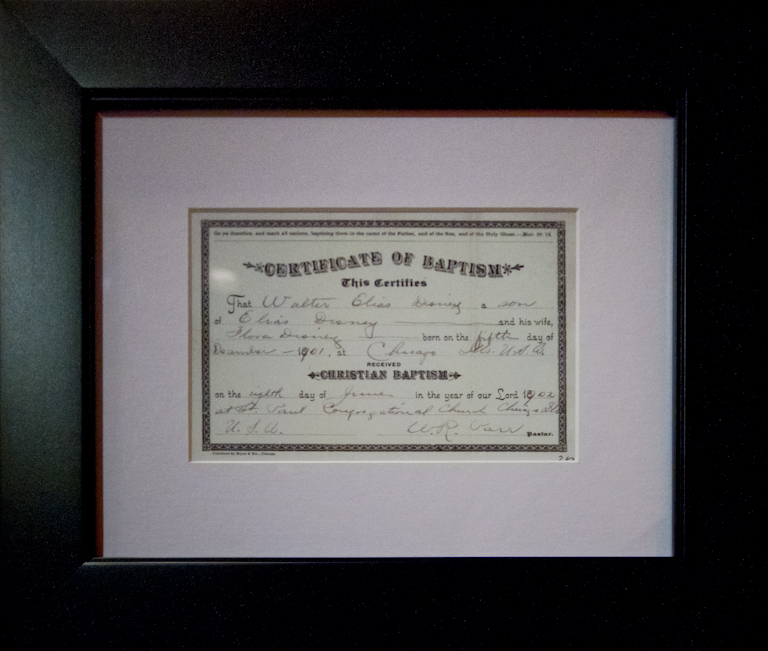 We start with the earliest of Disney artifacts, Walt Disney's certificate of baptism on June 8th, 1902. There was also a picture of Walt at what I think I remember the sign saying was his Christening. 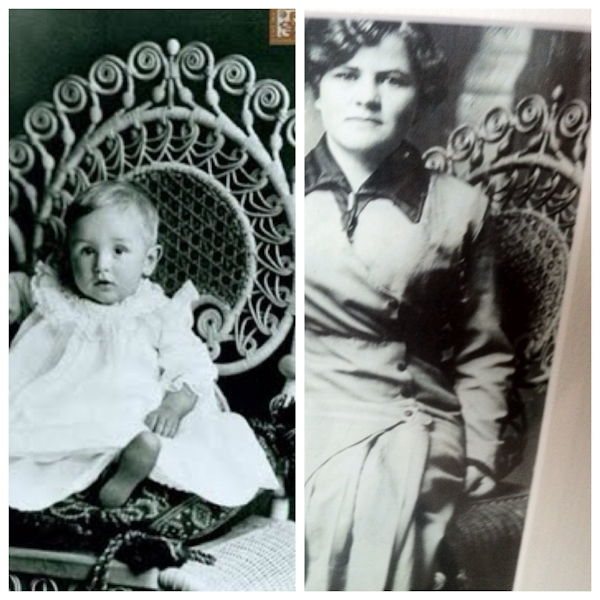 Ruston particularly liked this photo because he has a photo of his grandmother sitting in what looks to be the exact same style chair. Still living in Kansas City, Walt Disney opened his first studio, Laugh-O-Gram Films, in 1922. 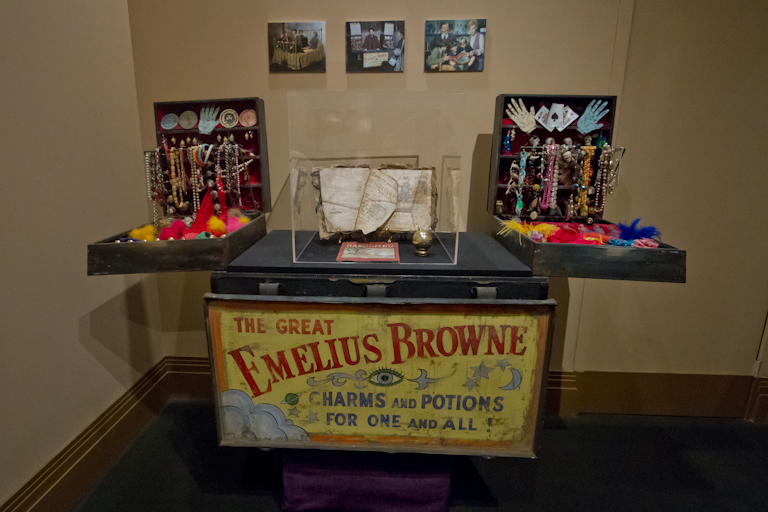 Two shares of stock sold to Walt's parents, Mr and Mrs Elias Disney. 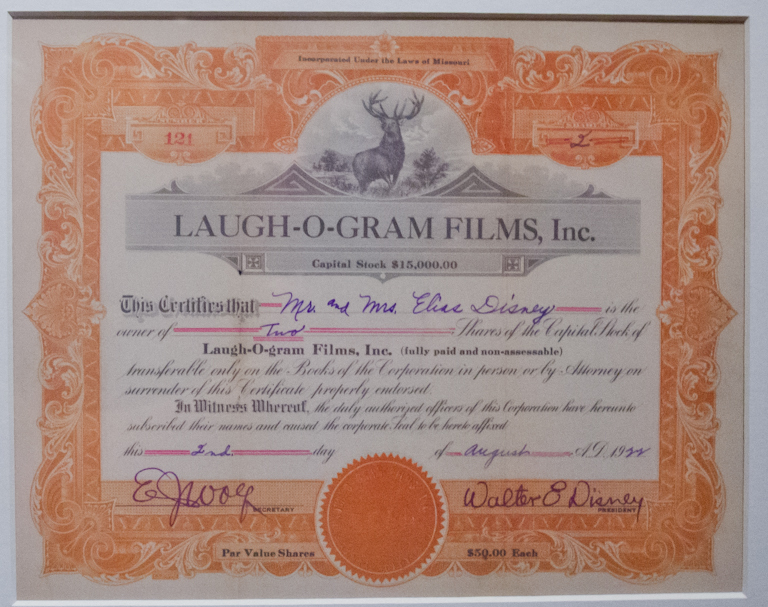 Sadly for Disney but luckily for us, Laugh-O-Gram Films declared bankruptcy in July of 1923. Walt sold his movie camera and bought a train ticket out to the city of dreams. 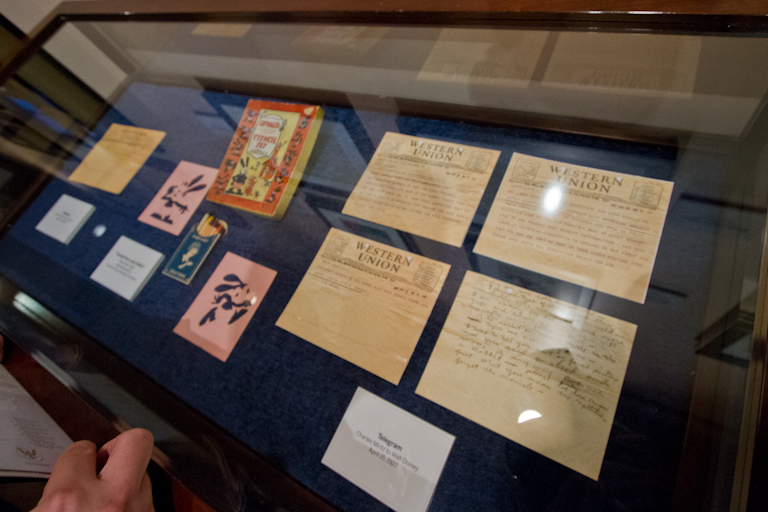 In the next display we see a few telegrams. 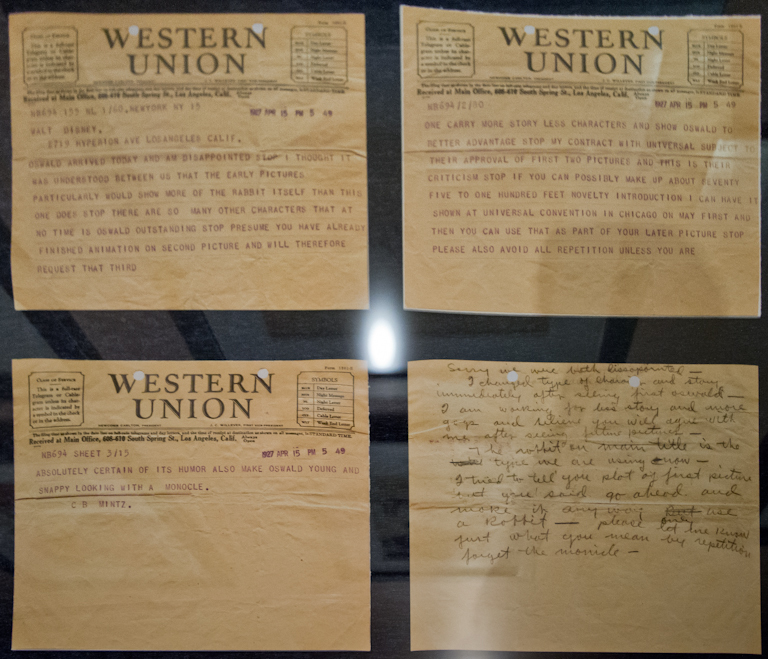 The first set of telegrams show a little bit of the back and forth arguments Walt had with C.B. Mintz over Oswald the Lucky Rabbit. 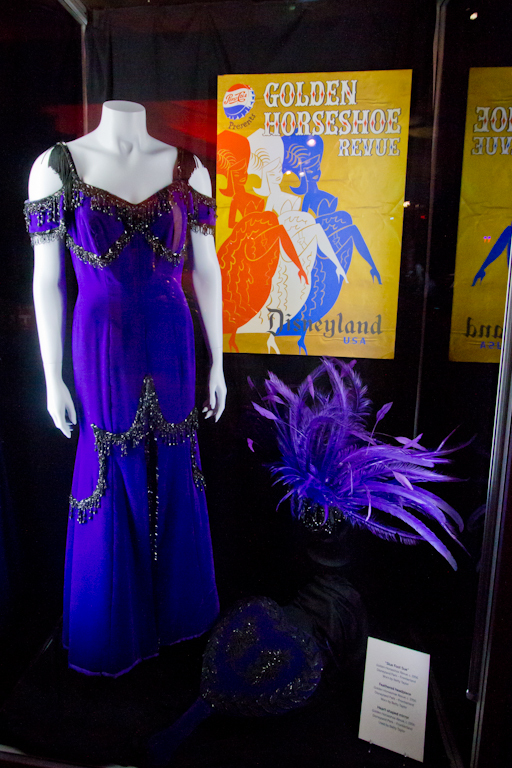 Oswald would go on to become quite a success in the 20s and 30s, though it was being distributed by Universal Pictures. We all know the story of what happened from there. Walt went to New York to renegotiate a better contract with Mintz due to the popularity of Oswald. Instead, Mintz asked Walt to take a paycut on the popular Oswald cartoons. Not only that, but he had hired away all his top animators except Ub Iwerks, plus owned all the rights to Oswald, so he had Walt in a bind. Walt didn't agree to the terms and was ready to return to California. 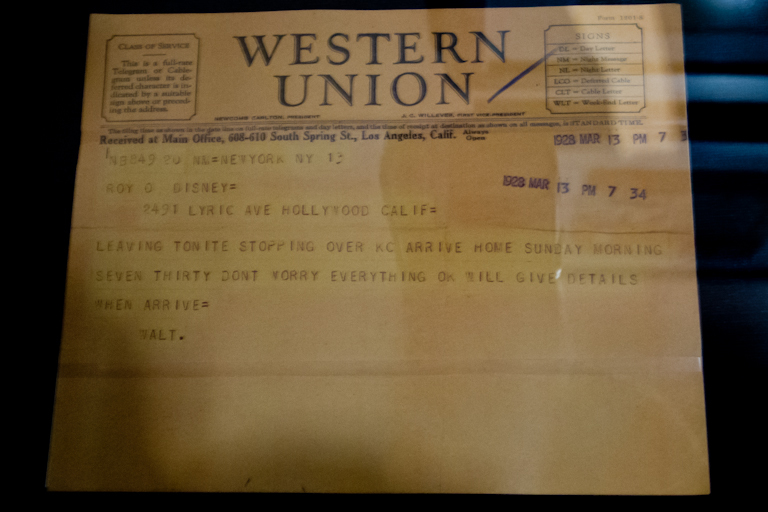 Not wanting to disappoint his brother though, Walt sent this famous telegram to his brother Roy saying everything was okay. 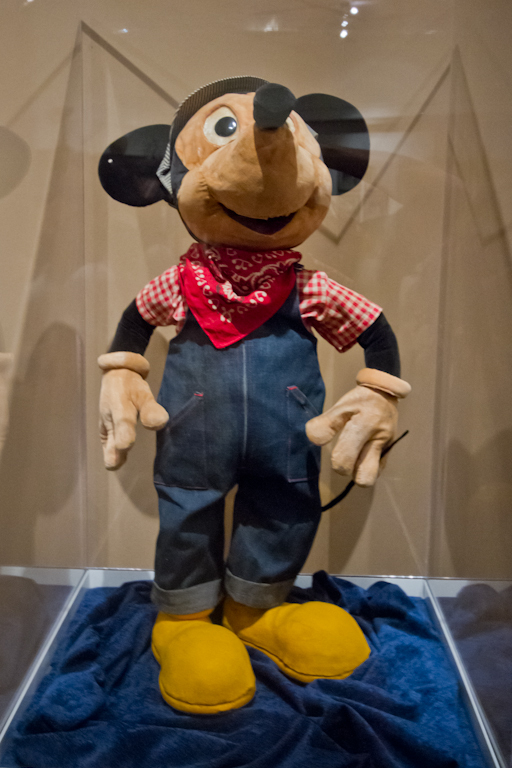 Luckily, Walt and Ub came up with the character of Mickey Mouse and the rest is history! 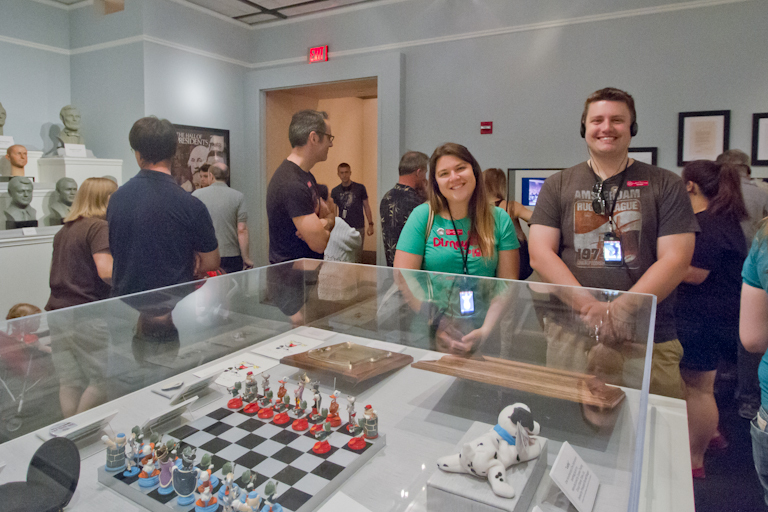 Mickey and his Silly Symphonies were a huge hit! 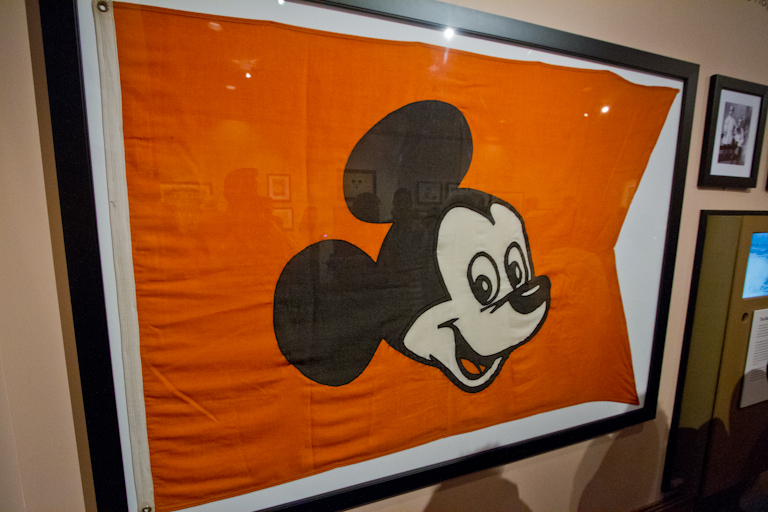 Walt soon started signing licensing deals with companies and Mickey Mania took off. 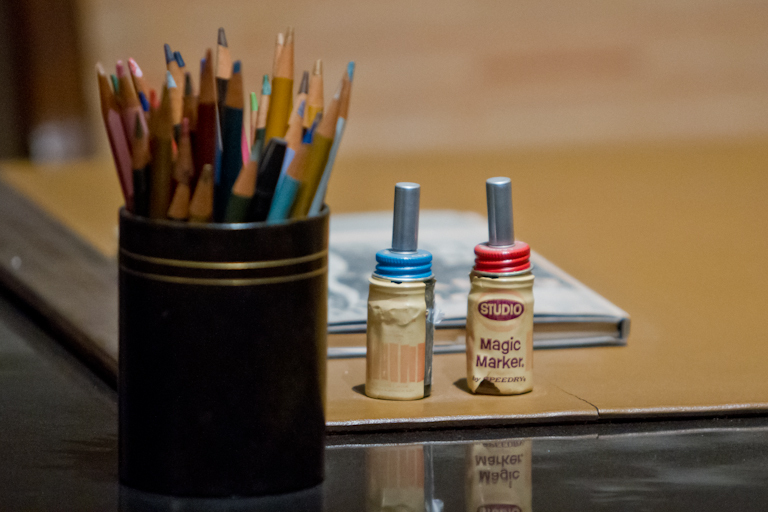 The Mickey writing tablet you see toward the left of the middle row was the very first licensed Mickey product created. 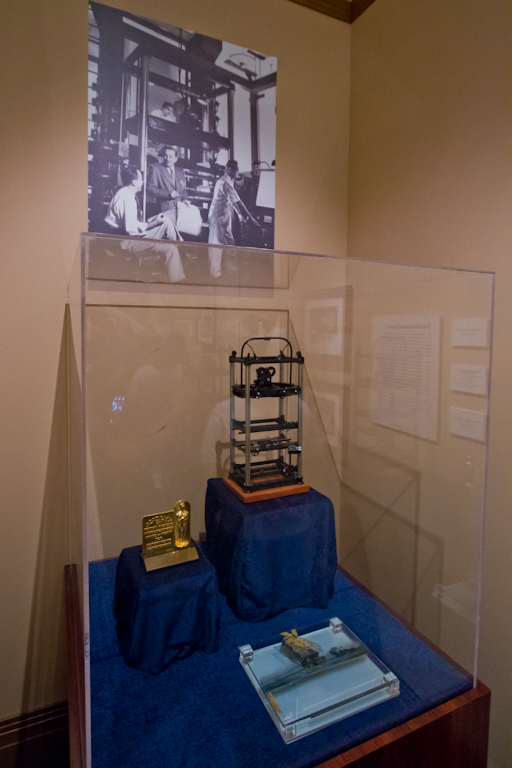 Knowing a flat cartoon would be difficult to watch for a feature length film, Walt asked his team to create a multi-plane camera that would help add dimension to the film. 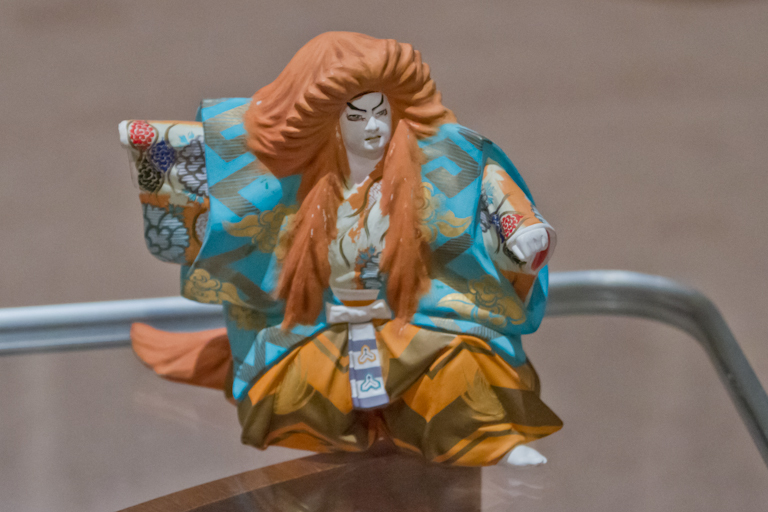 This is a small model of the 12 foot tall original. 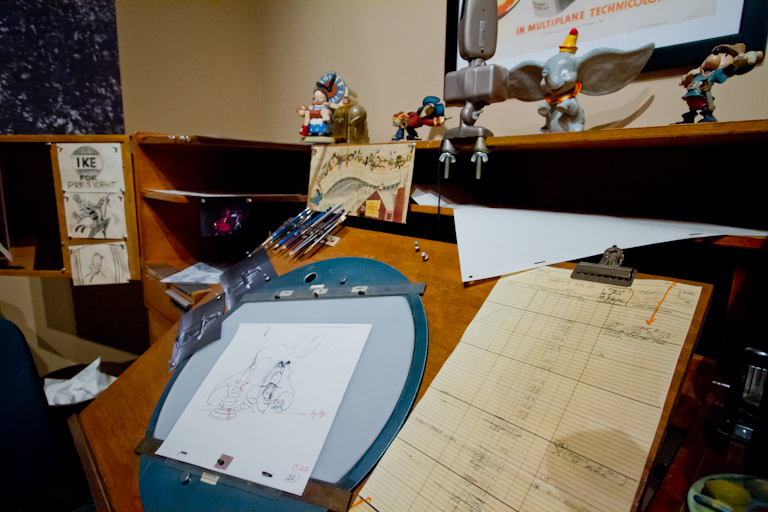 The animator's office here is modeled after what one of the Nine Old Men would have used. 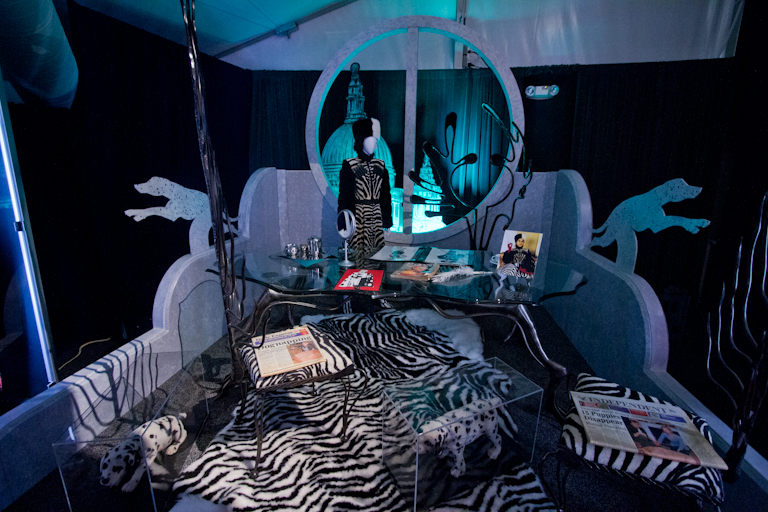 A closer look at the desk with a Captain Hook sketch on it. Plus some of the maquettes above the desk for reference. 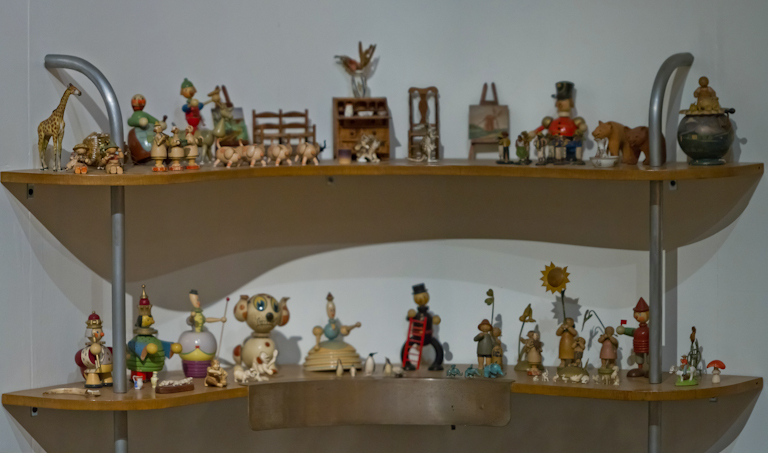 From left to right, we see one of the many clocks from Geppetto's wood working shop, an early version of Captain Hook, Dumbo of course, and maybe the Brave Little Tailor. 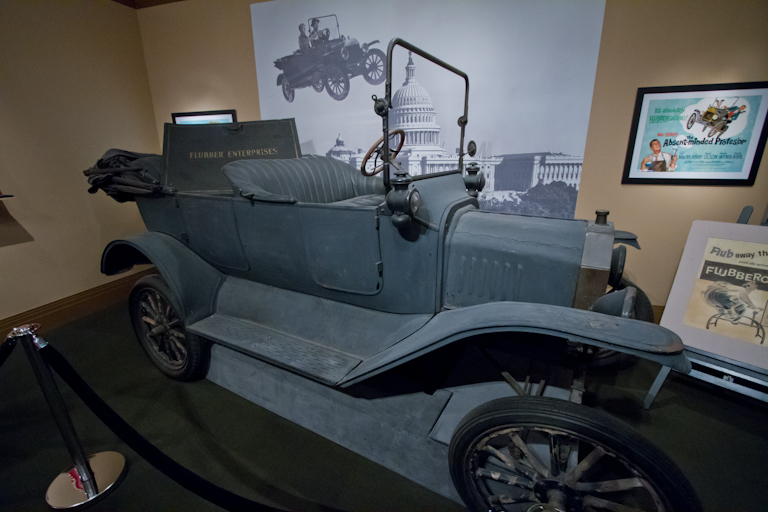 Next up were some awesome pieces of history. 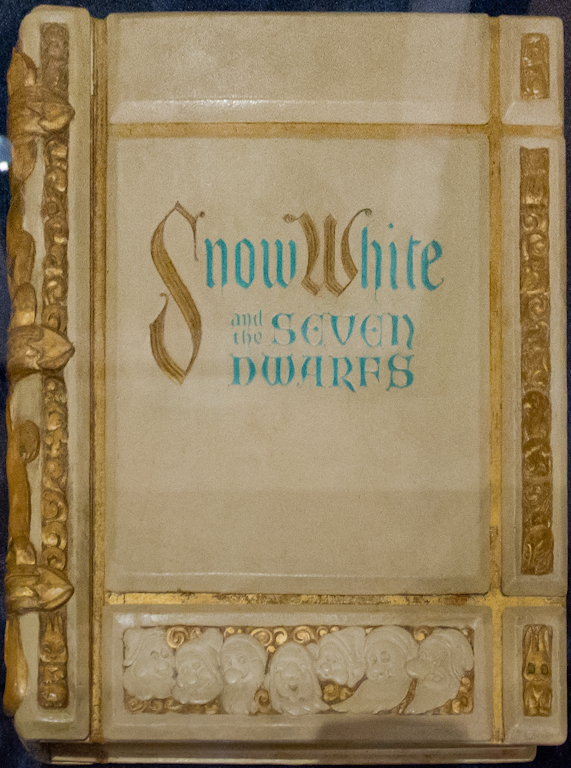 The beginning of Snow White, Cinderella and Sleeping Beauty all start with a live action sequence with a physical book is opening. This was the actual book used in that original sequence! 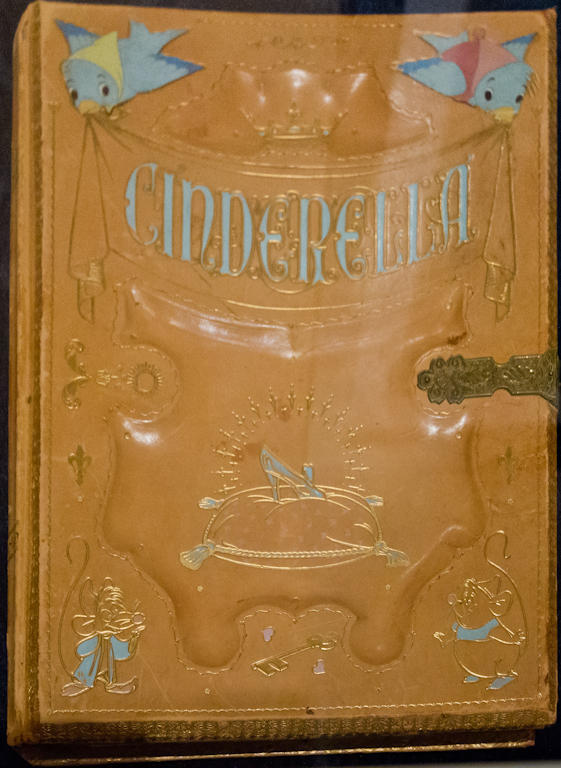 And the original book for Cinderella. 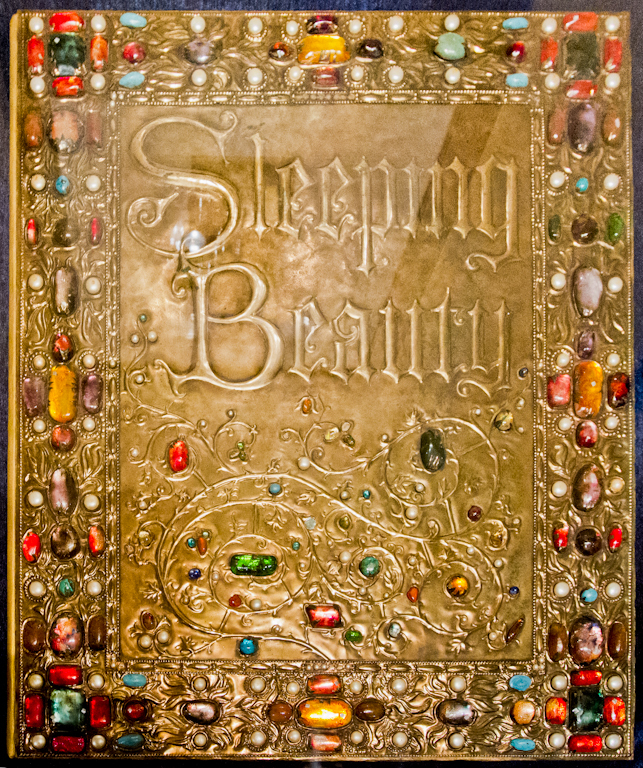 And the very elaborate brass covered book filmed at the beginning of Sleeping Beauty. 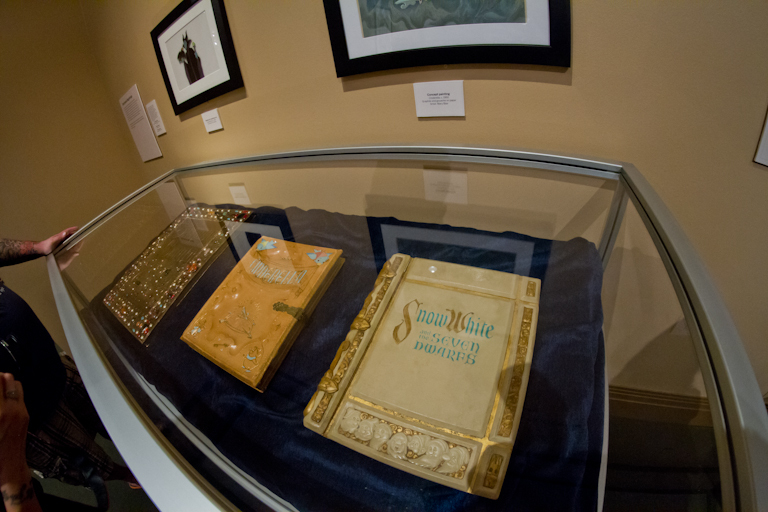 These are the great pieces of Disney history I really enjoyed seeing. 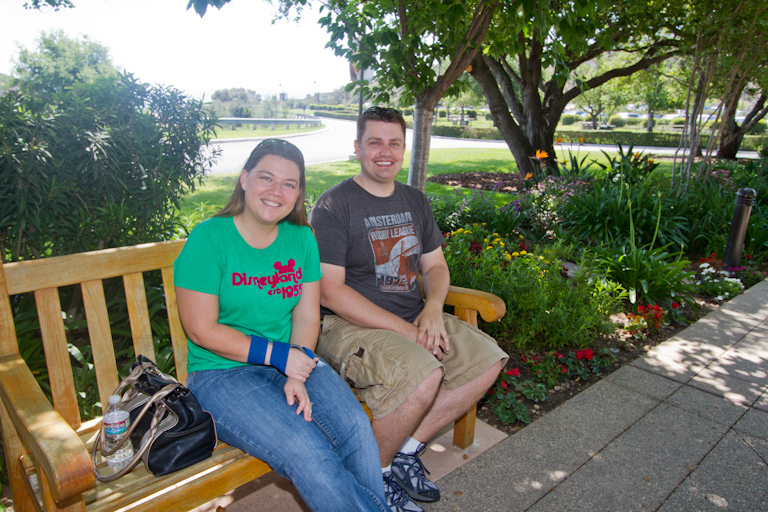 Next up was a visit to Walt's office at the Disney Studios. 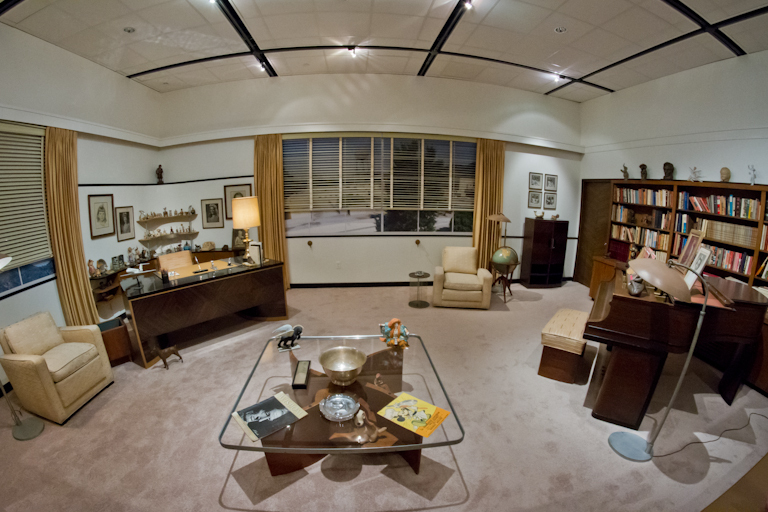 This was an exact replication of Walt's working office in Burbank. 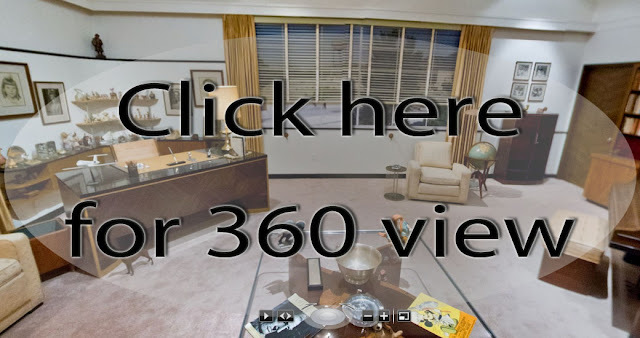 Click below to see a panorama I took of the office. I really enjoyed seeing the piano. This was where the Sherman brothers came and played all their wonderful songs to get Walt's thoughts on them and whenever Walt asked them to "play the song" they knew he wanted to hear "Feeding the Birds" from Mary Poppins. 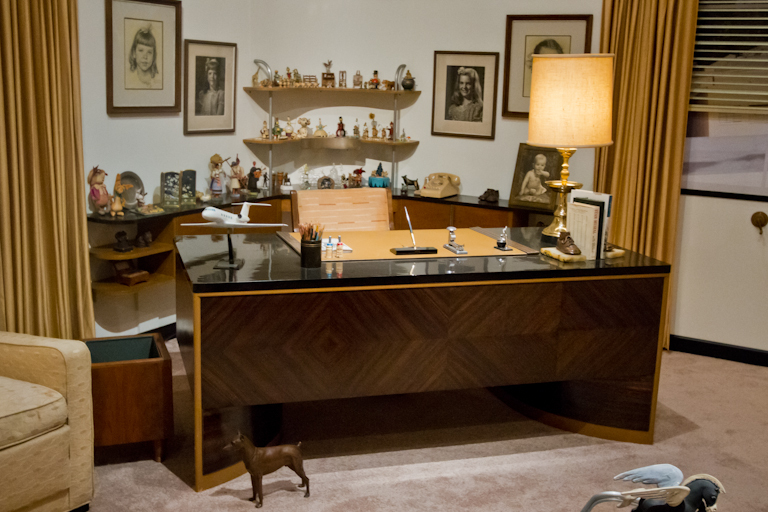 This is Walt's original desk from his office. 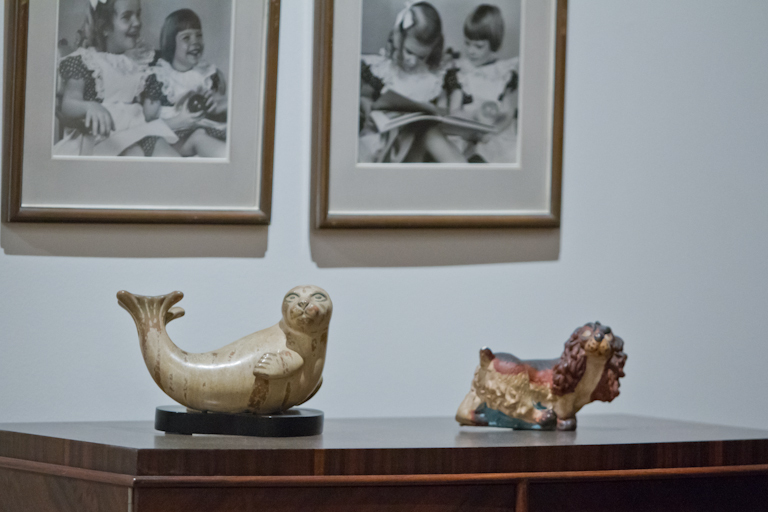 Behind the desk you can see the Norman Rockwell sketches of Walt's daughters. 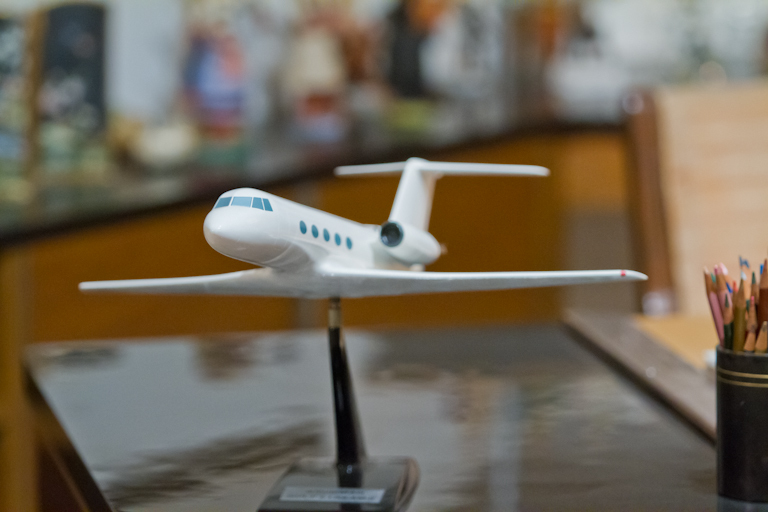 If you remember if one of my last posts of our visit to Club 1901, I showed you a model of a Gulfstream II that Walt had on his desk. Well the last one was a reproduction. This one happens to be the original. 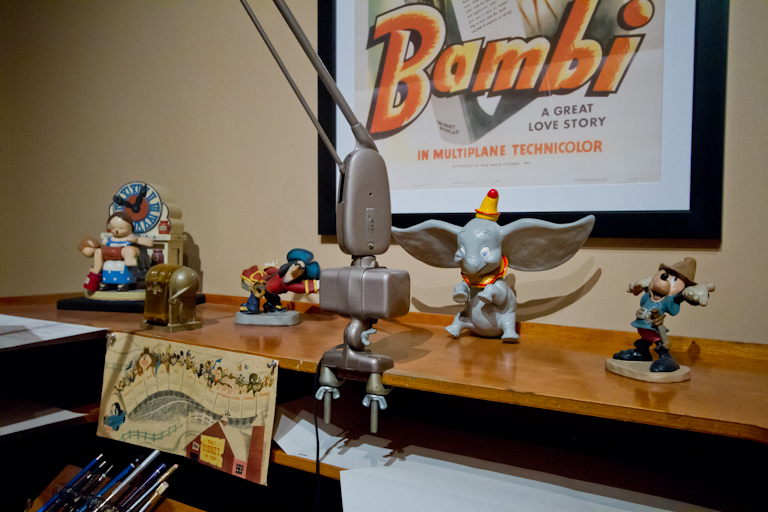 I don't recognize many of the items behind the desk, but figured I should photograph them anyhow. 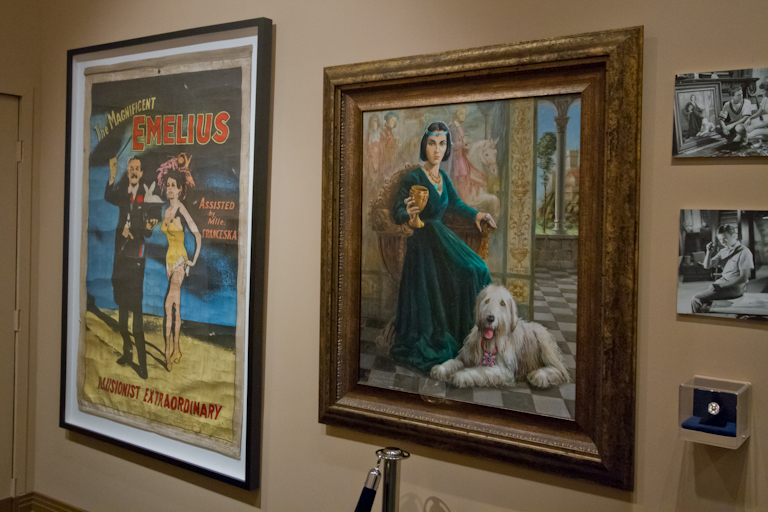 Photos of his daughters on the walls. I'm not sure what the significance of the seal below them is. 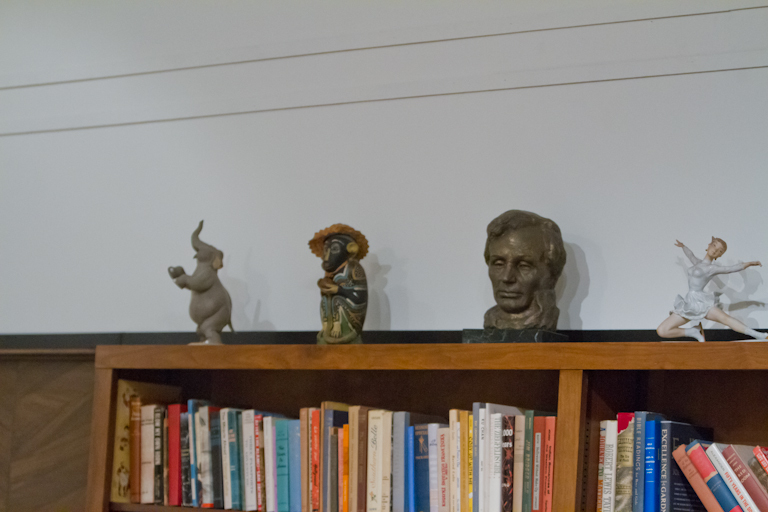 Of course he would have a bust of Lincoln on his bookshelf. 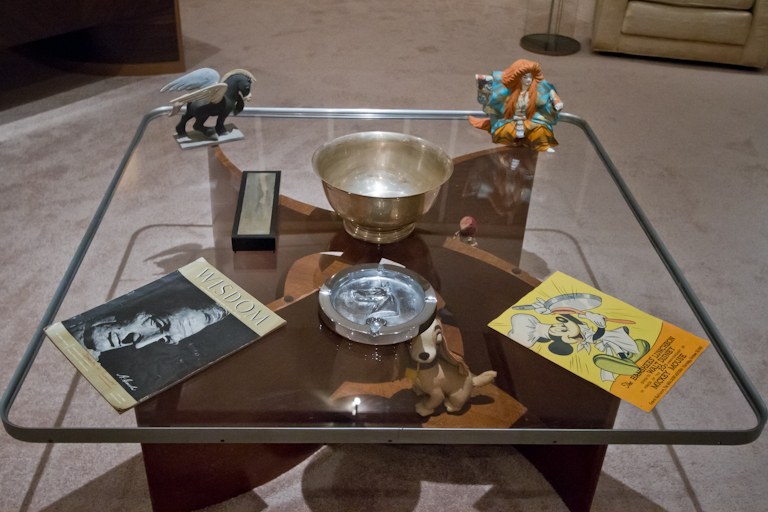 The coffee table in his office. 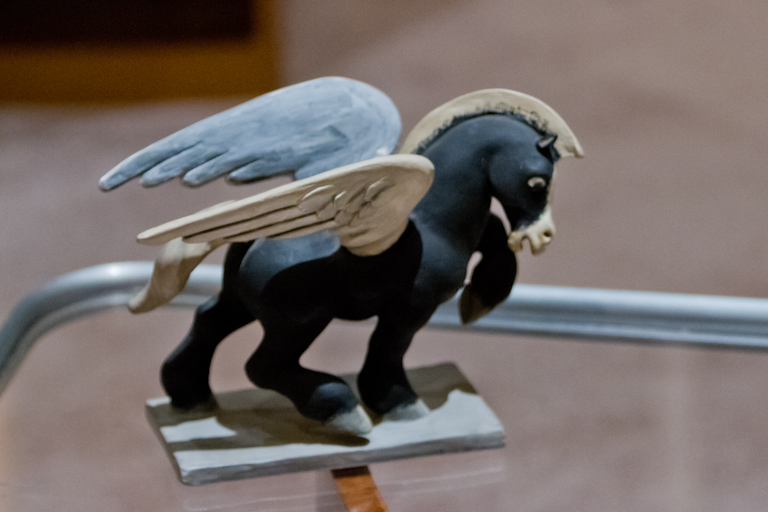 I recognize the pegasus from Fantasia. But I don't know what this is from. Any thoughts? 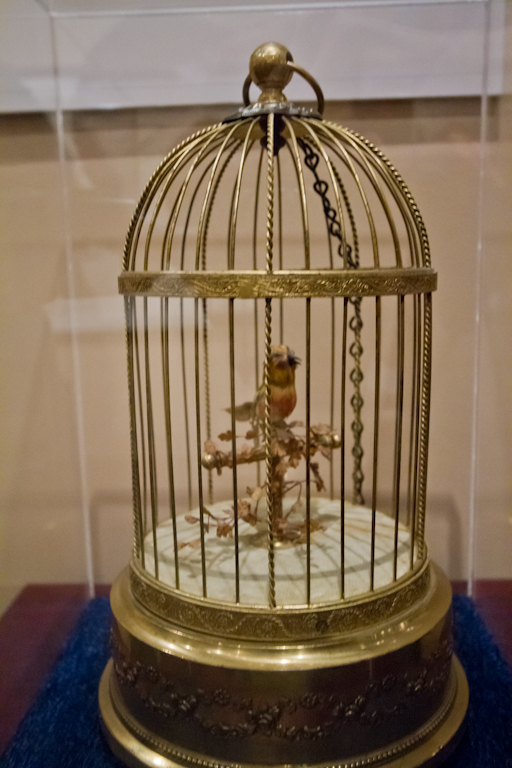 Taking a look at the mechanical bird that inspired Walt to create audio-animatronics. This happens to be the second time we've seen this item. 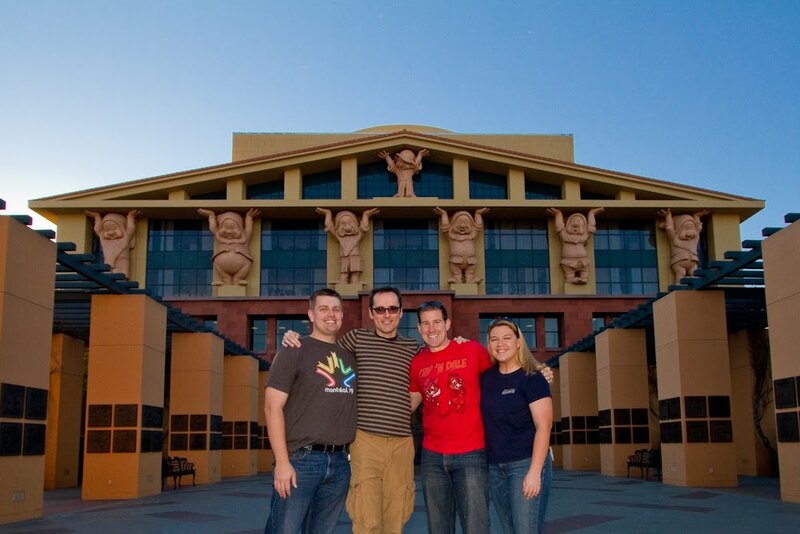 The first was in January 2011 when Ruston invited us to take a tour of the Disney Studios, including a visit to the archives. 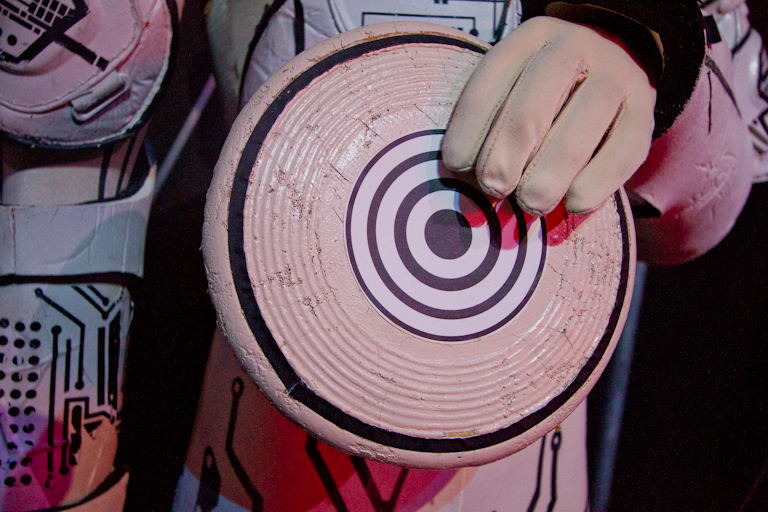 I'm sure you've seen this Mickey before. 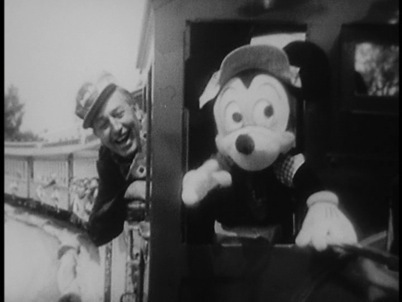 He was riding with Walt at the front of the train in the Dateline Disneyland special from 1955. See the 1:07:30 mark in the video below. 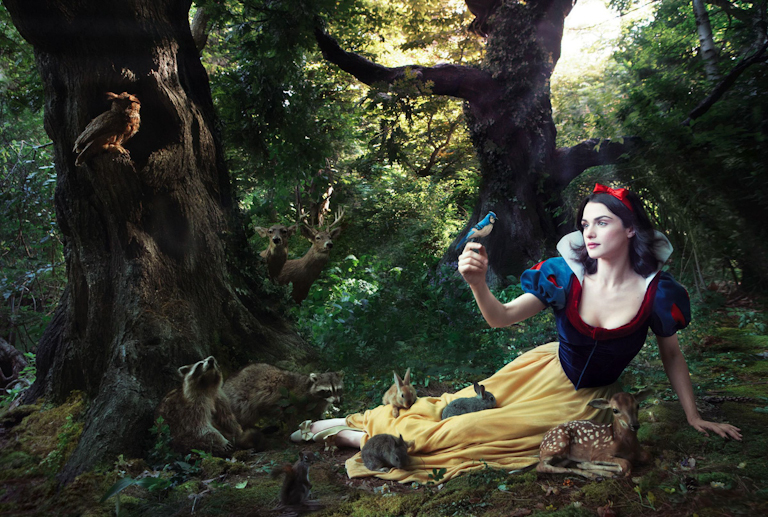 It's not just animation Walt was involved in. 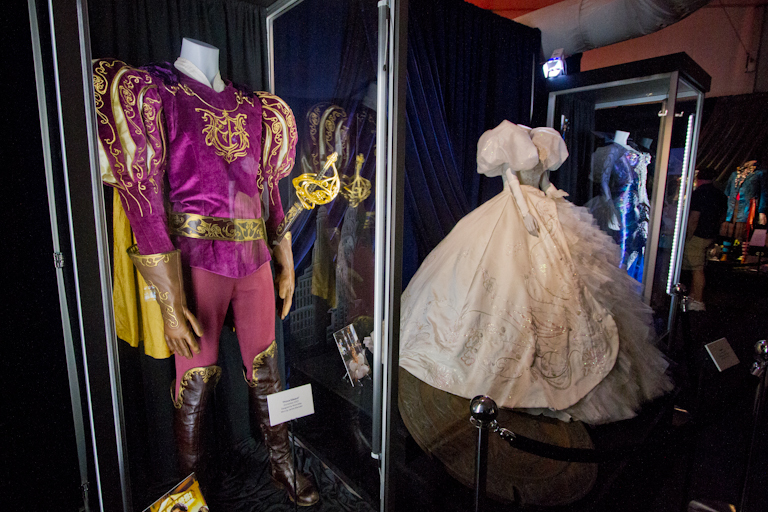 Some of our favorites are the live action movies. 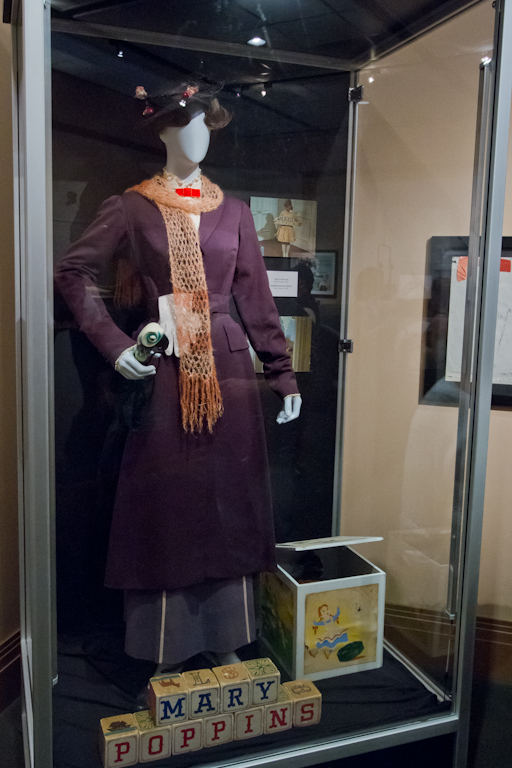 Case in point, Mary Poppins. 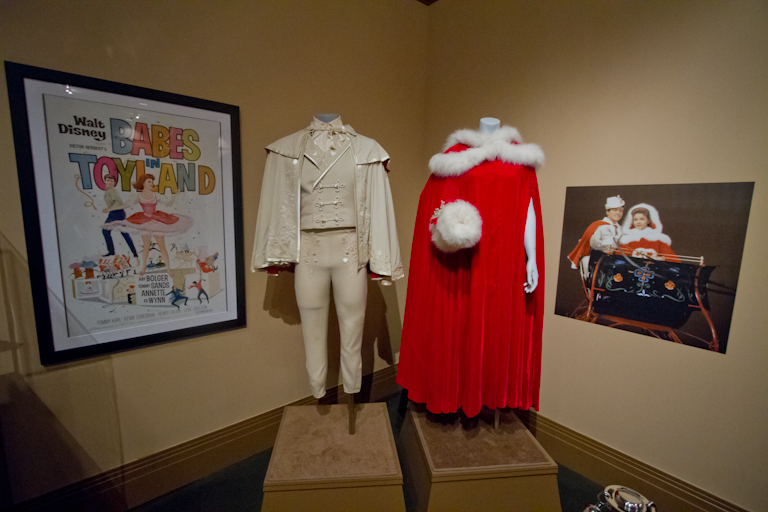 This is the screen worn traveling costume used by Julie Andrews, plus the blocks and jack in the box used in the nursery clean-up sequence while singing "A Spoonful of Sugar". 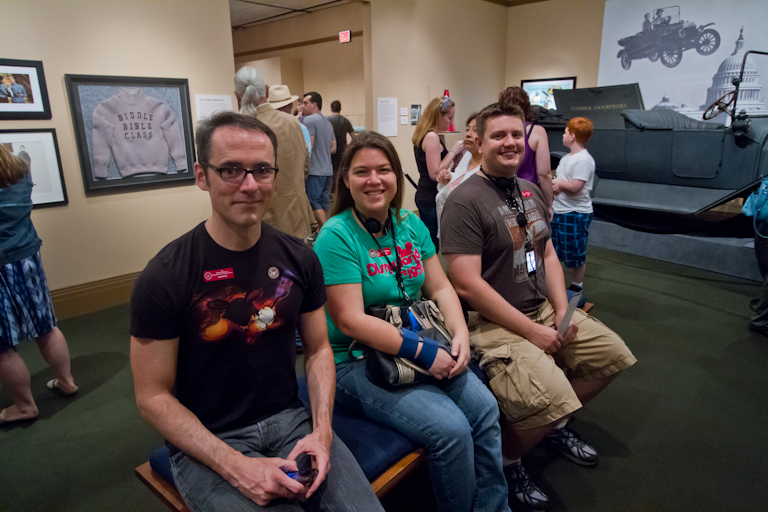 Ruston, Theresa, and Jacob taking a short break. 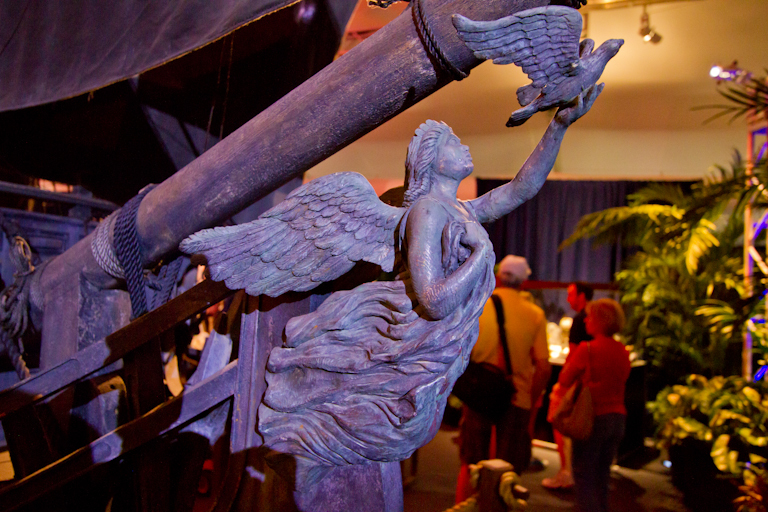 So they can take a look at the Nautilus. 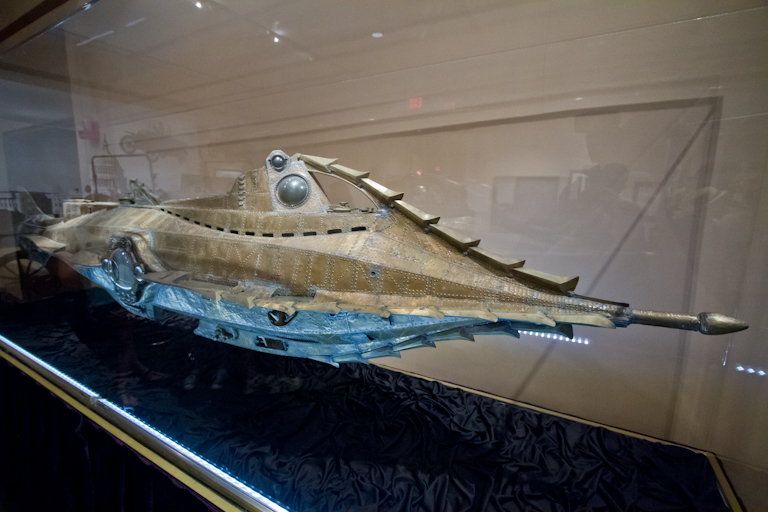 This 1000 pound model was submerged and fitted with motors and lights for use in 20,000 Leagues Under the Sea. Next up, we visit the Absentminded Professor and his new invention, Flubber! 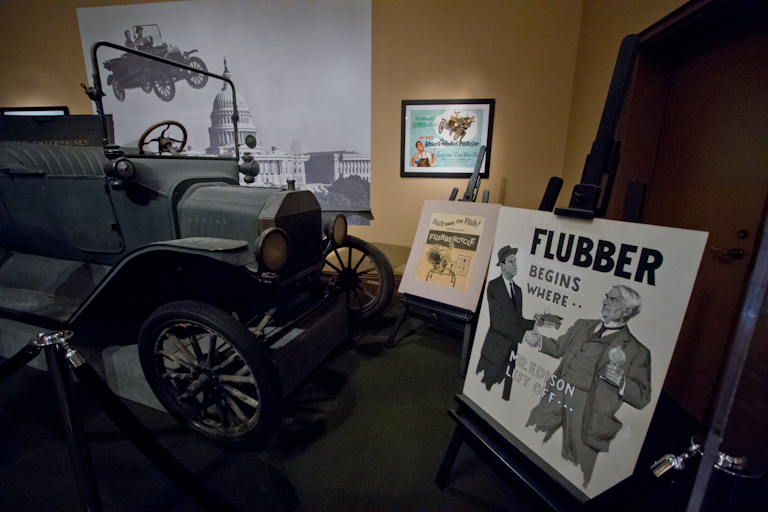 And the flying Model T Flubber car. 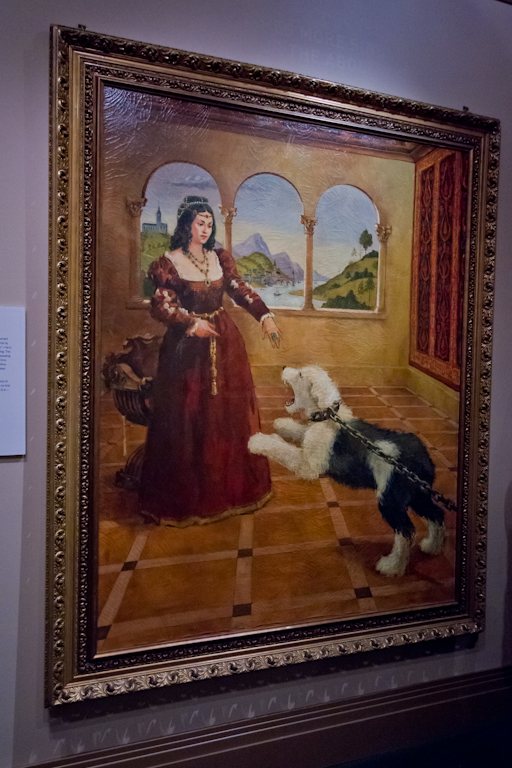 Though Theresa enjoyed watching it growing up, I wasn't ever a huge fan of Bedknobs and Broomsticks. And I still haven't seen Darby O'Gill and the Little People. Guess I have a few more Disney movies to watch. I did watch the Shaggy Dog though. 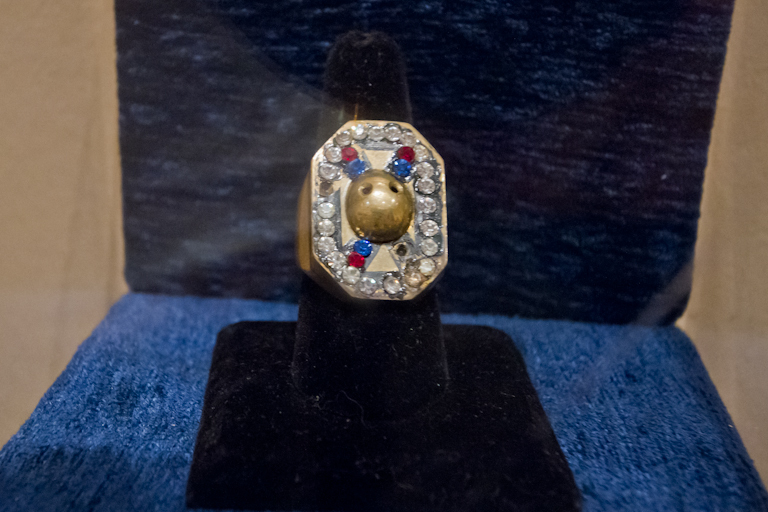 Read the inscription on this ring, and you'll be transformed into a giant sheep dog. Babes in Toyland is another movie I haven't seen, so I don't have much to say about this one either. There is so much more stuff to come. We'll continue in part 2! 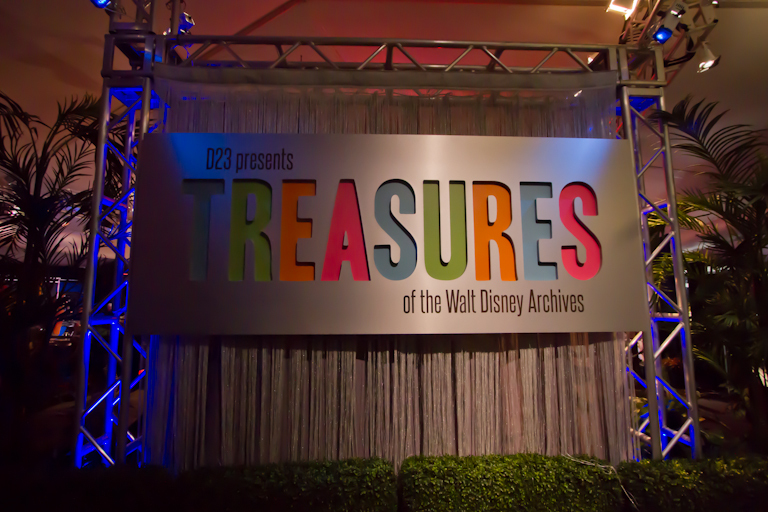 Continuing our visit at the Treasures of Walt Disney Archives exhibit at the Reagan Library, we exited the main building and enter a large tent set up in the parking lot. Click here for part 1. 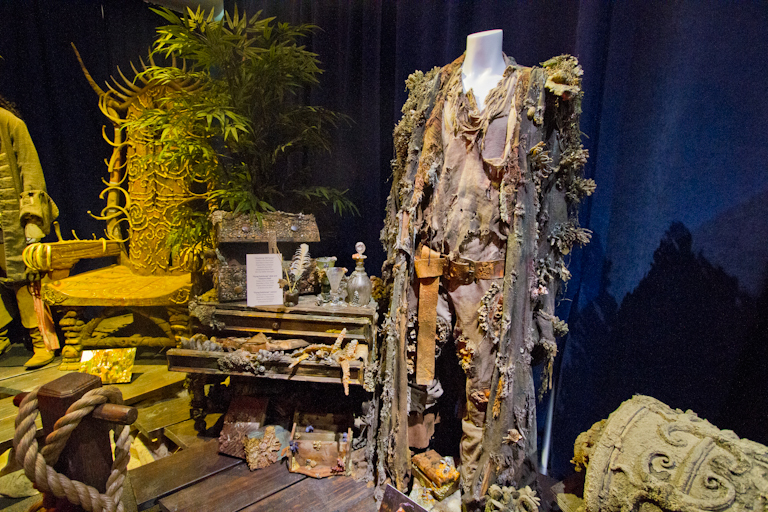 This portion of the exhibit was chock full of costumes and props from some of our favorite movies. Well maybe not all our favorite movies. 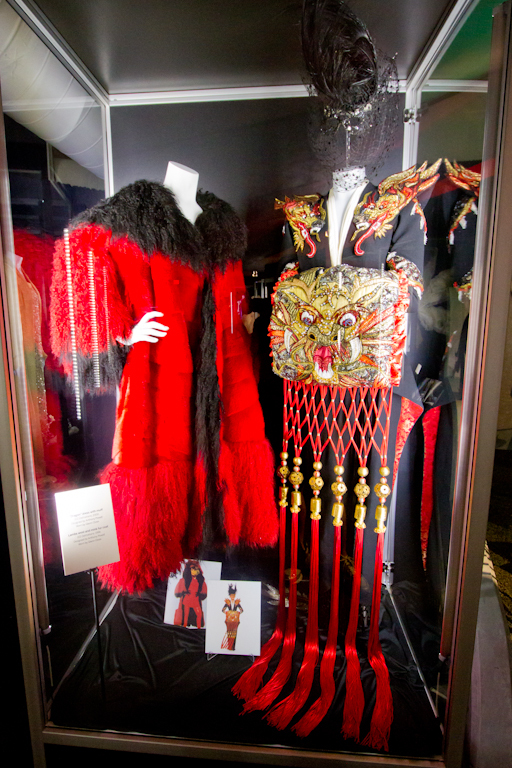 The first thing we see are costumes from 101 and 102 Dalmatians with Glenn Close. I can't say that I've ever seen these movies, so these didn't connect with me so much. 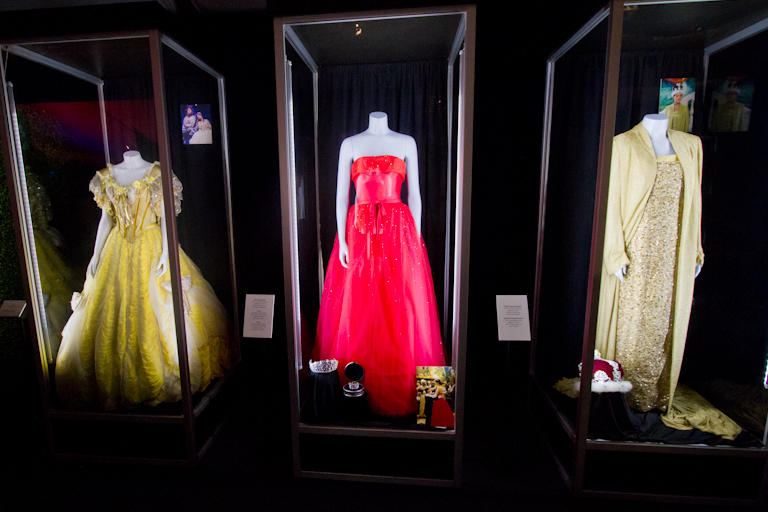 Nor did the Princess Diaries or Princess Diaries 2 costumes. Ah, here we go! 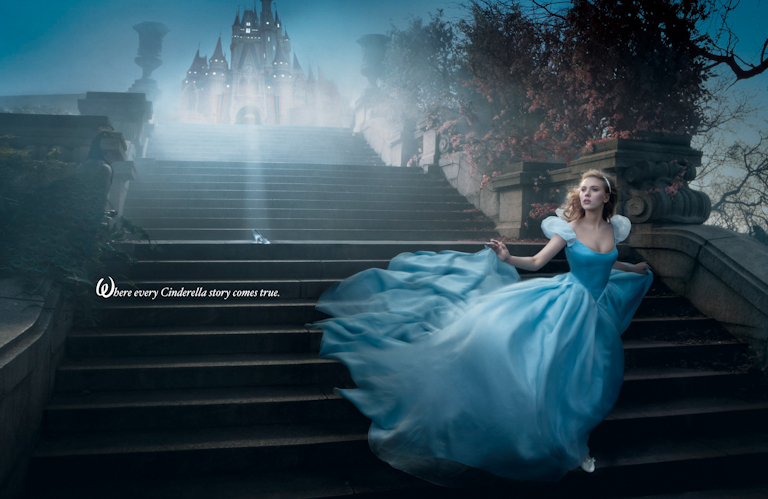 We really enjoyed the Disney movie Enchanted. 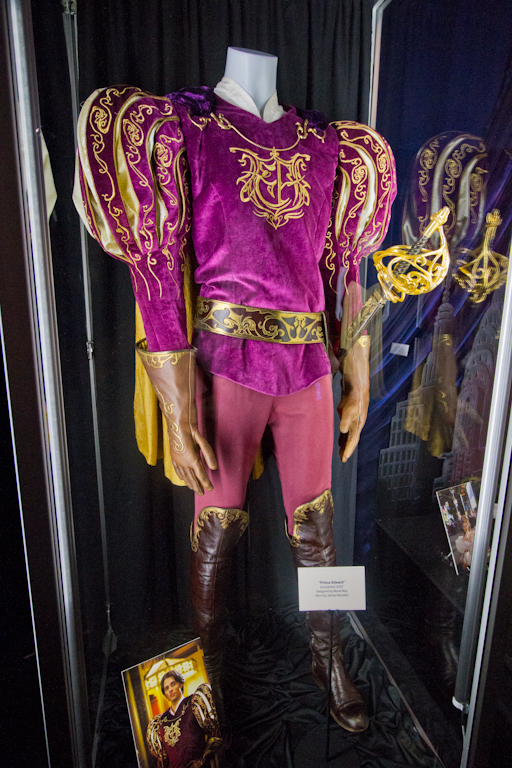 Prince Edward's (James Marsden) costume with some huge puffy sleeves. 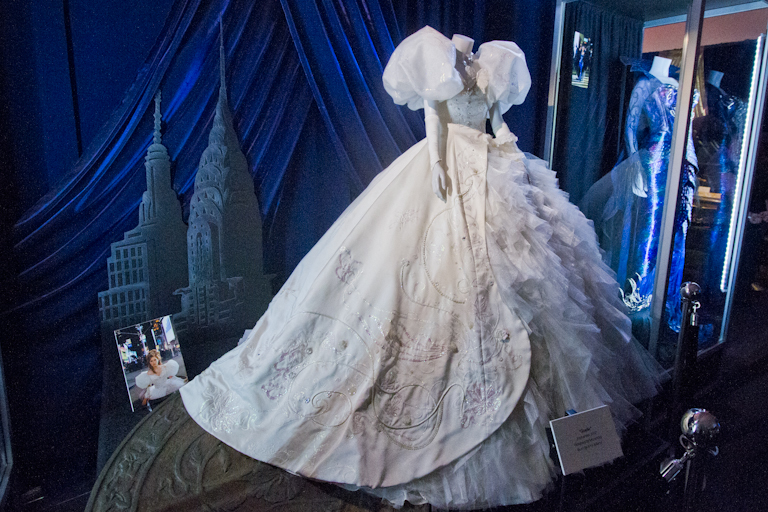 Gisellle's (Amy Adams) huge dress she wore around New York. 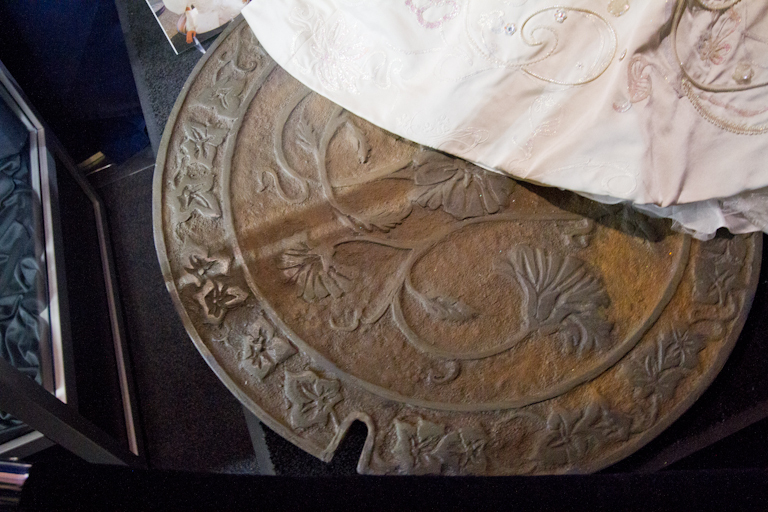 Plus the manhole cover she popped out of. 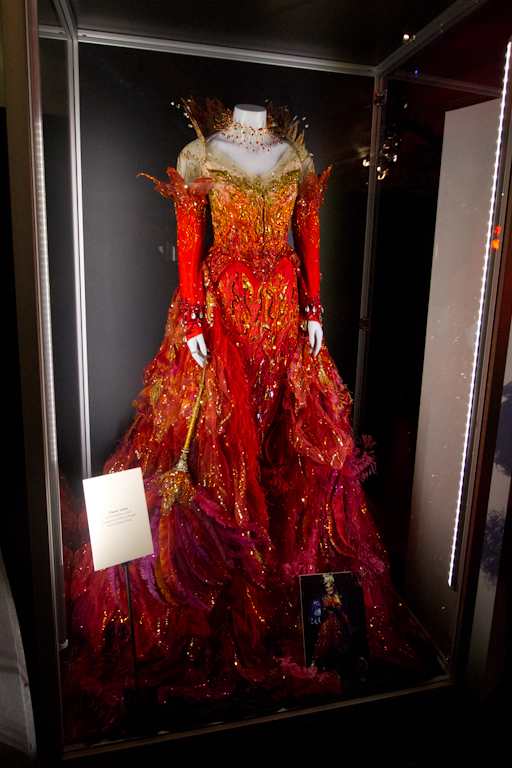 Queen Narissa's (Susan Sarandon) had a very detailed costume that was fun to see. 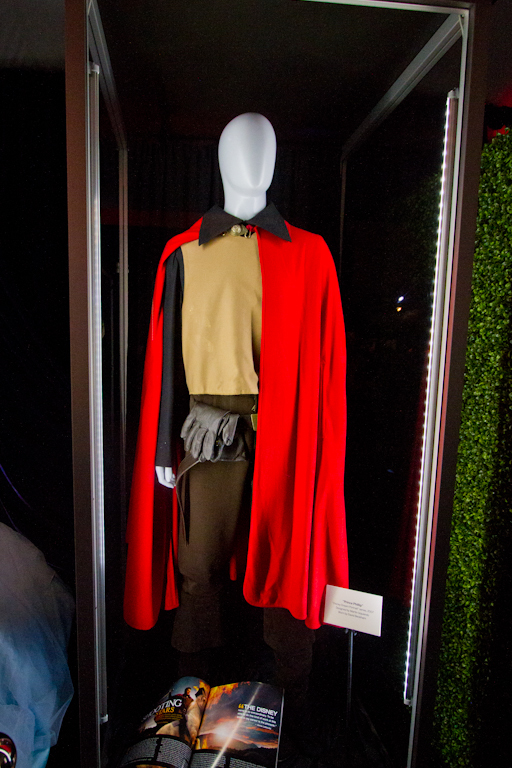 And here are the costumes used in that photo shoot. 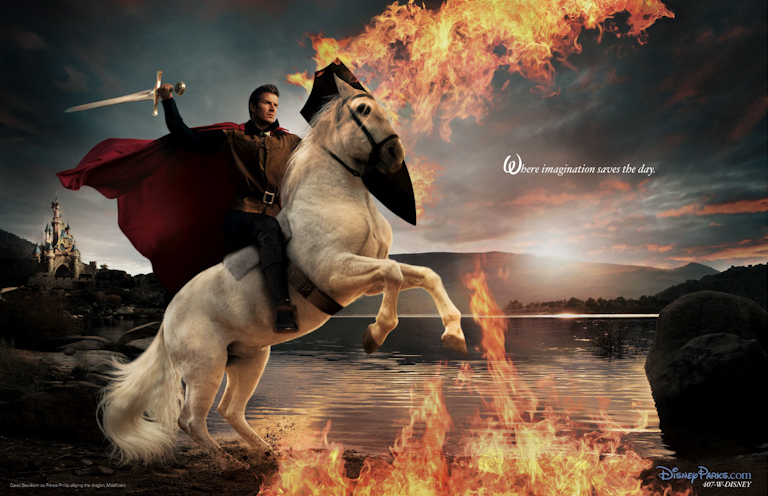 Next up was David Beckham as Prince Phillip from Sleeping Beauty. 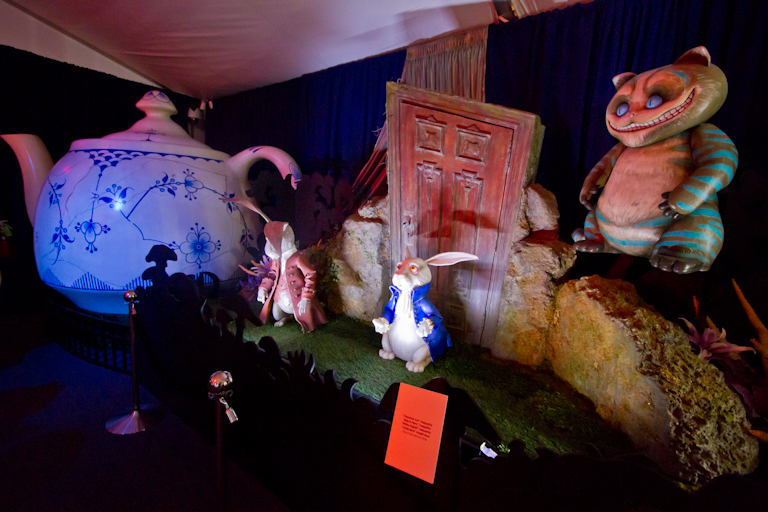 Tim Burton's Alice in Wonderland was a little odd for me, but they had quite a few maquettes from it. 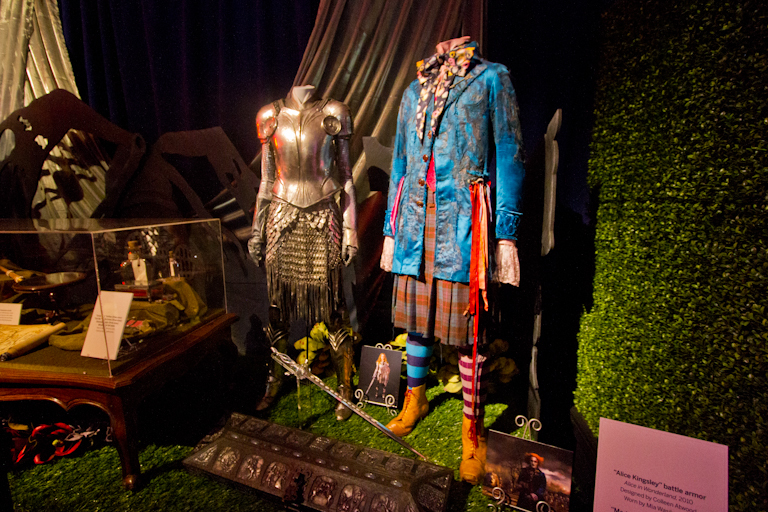 We also saw Alice's warrior armor, plus the Mad Hatter's battle dress. 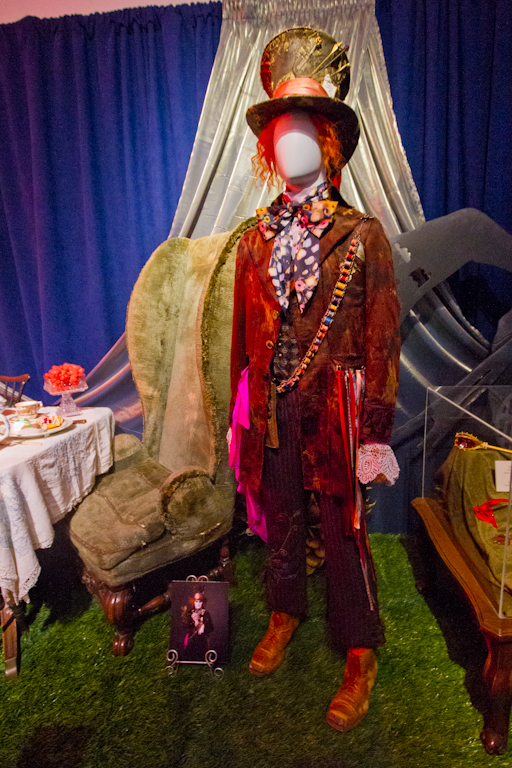 The Mad Hatter's normal costume. 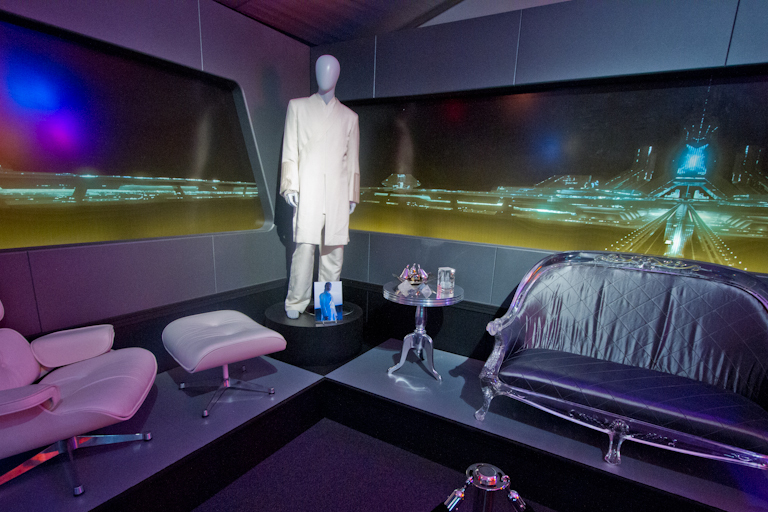 Next it was time to visit the world of Tron. 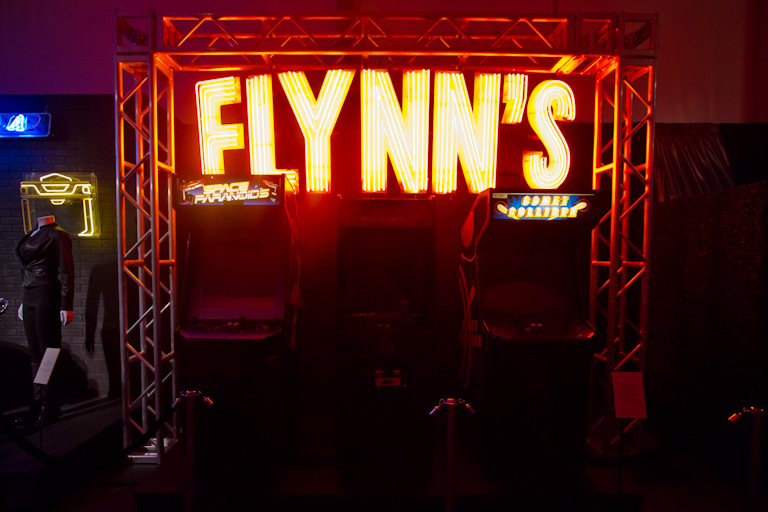 Some of the classic video games. 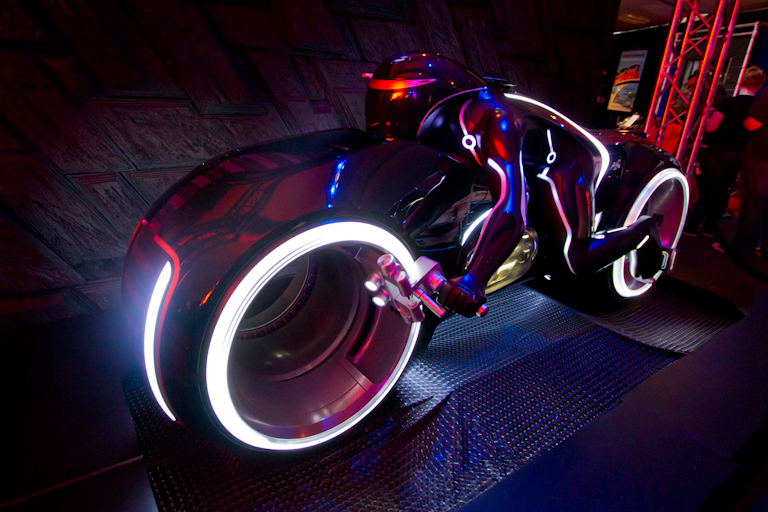 One of the newer light cycles based on Tron Legacy. 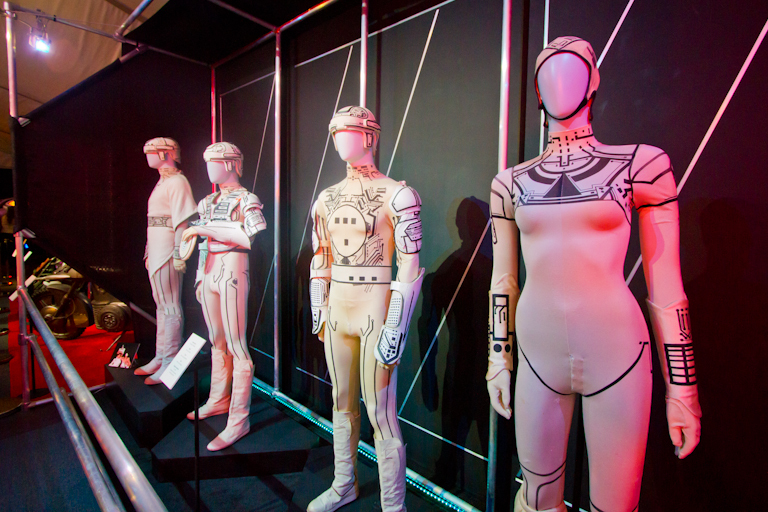 Then we travel back 30 years to the original Tron. 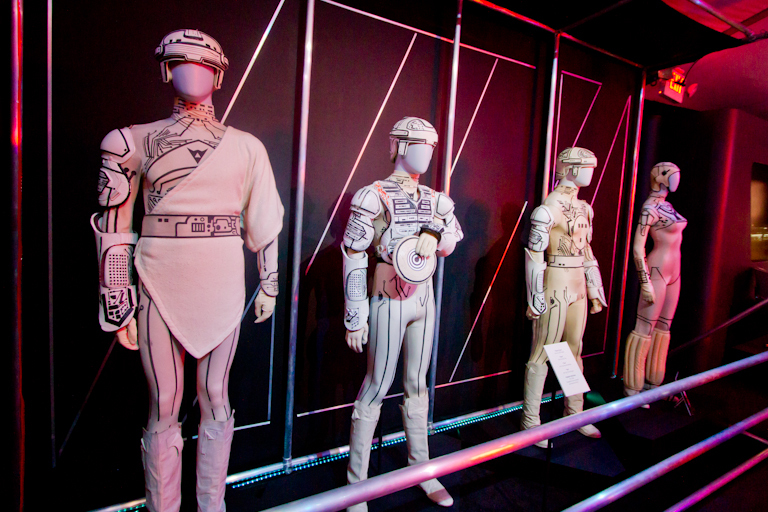 Here we see Kevin Flynn, Ram, Tron, and Yori. Next we got to see one of the newer Disney properties! 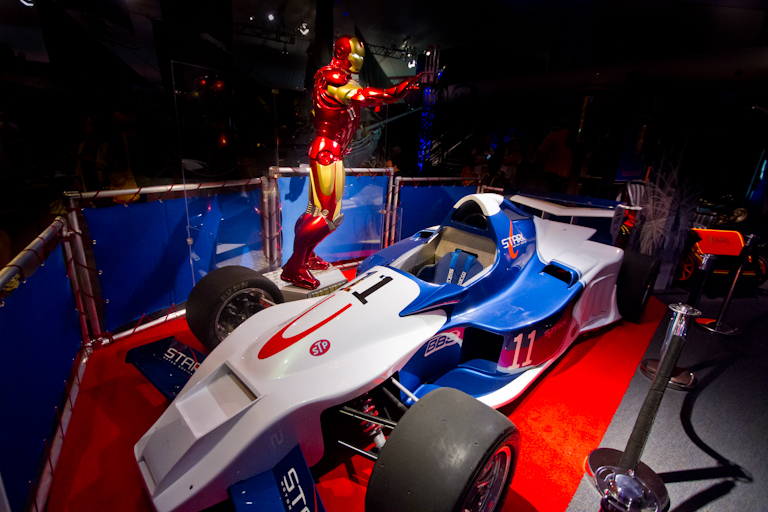 From Iron Man 2, we see the Iron Man Mark VI armor along with Tony Stark's Formula One race car. 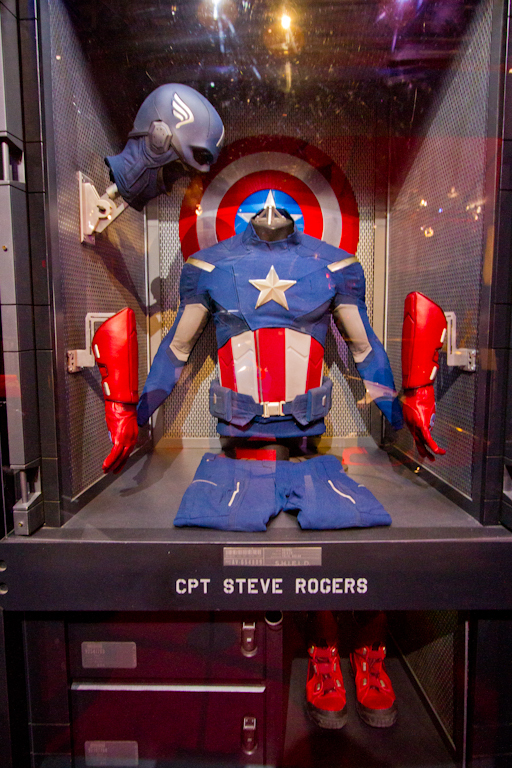 We also see items from Captain America: The First Avenger. 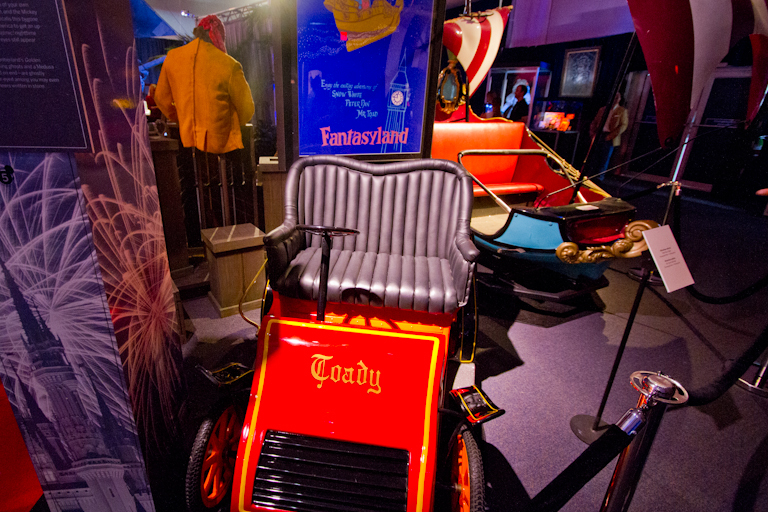 Then we looked at pieces from classic Disney attractions, like the motor car from Mr Toad's Wild Ride and a flying ship from Peter Pan's Flight. 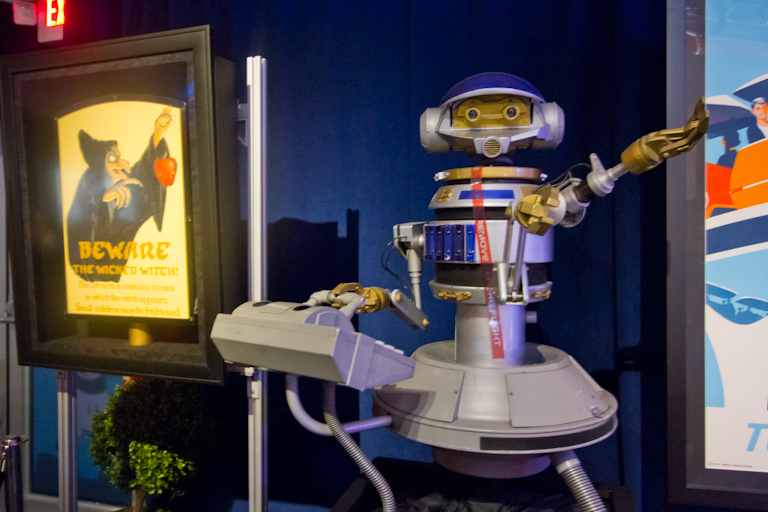 Captain Rex from the original Star Tours. This was a really cool piece to get close to. In the production of Fantasmic on the River's of America at Disneyland, the finale has Mickey battling Maleficent who has turned into a dragon. 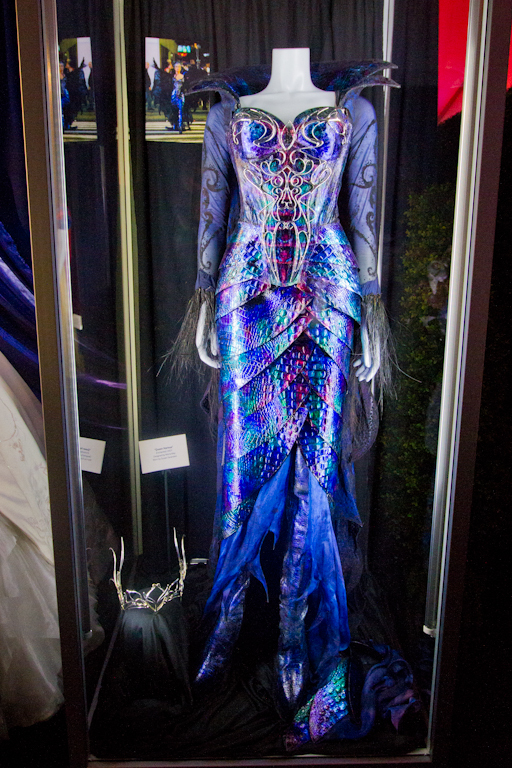 In 2009, the dragon was replaced with a more detailed version. 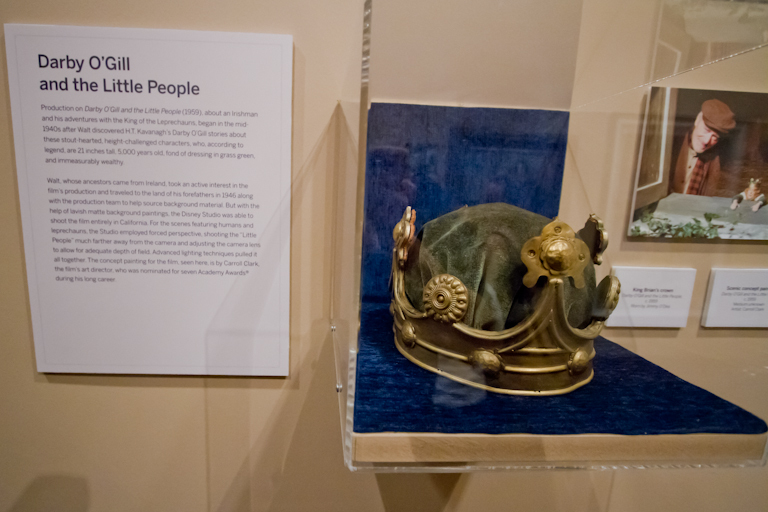 This head is from the original. 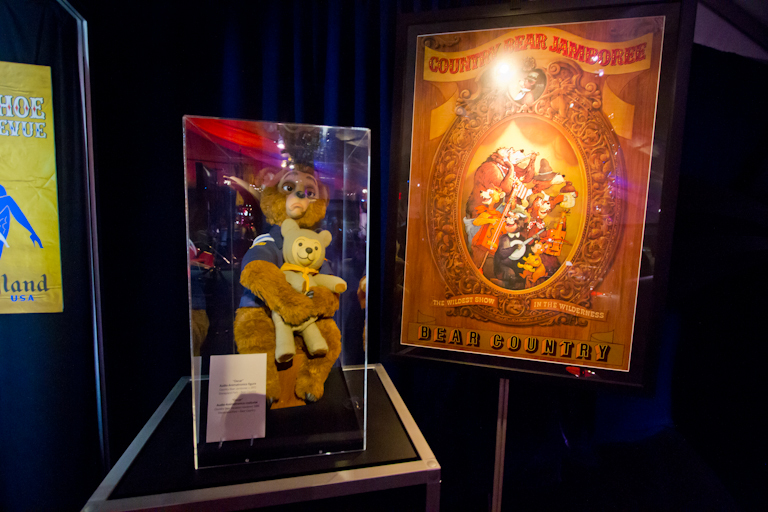 One of the attractions removed from Disneyland, the Country Bear Jamboree. Theresa's okay with that though. Now it houses Winnie the Pooh, one of her favorites. While we did miss the original Golden Horseshoe Revue, we did get to see the Tribute to the Golden Horseshoe back in February. 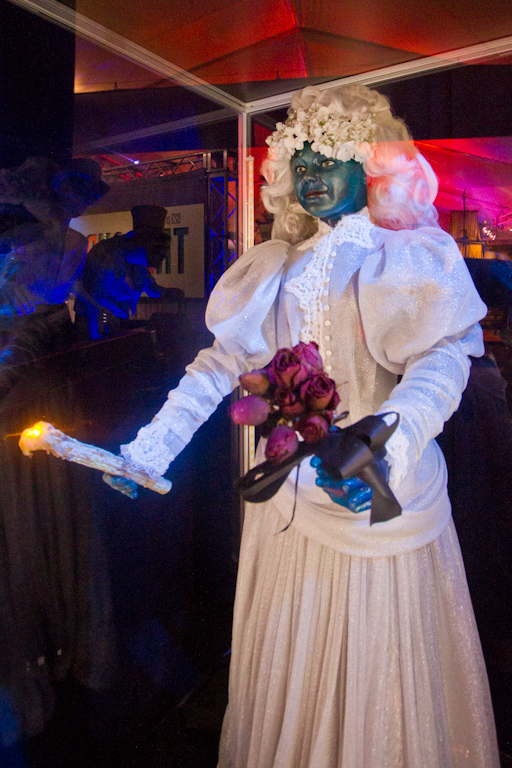 The original Haunted Mansion bride. 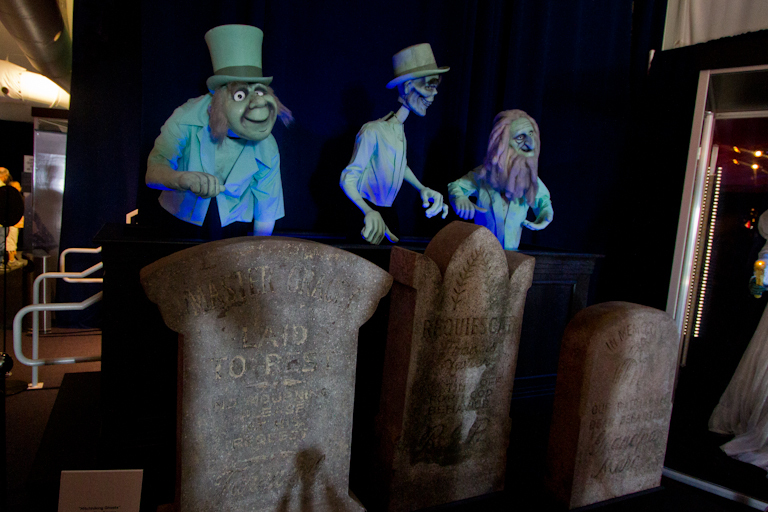 Phineas, Ezra and Gus posing above the famous tombstones of Master Gracey, Francis Xavier, and Grandpa Marc. 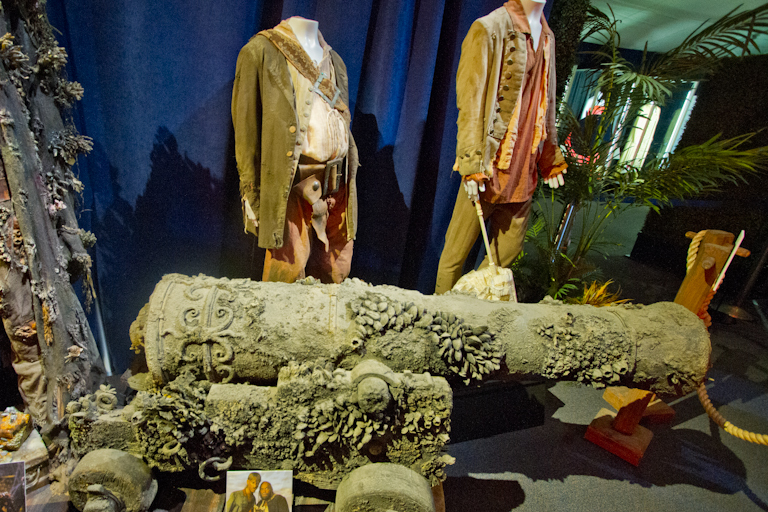 Finally, we got a close up of the Pirates of the Caribbean animatronics. 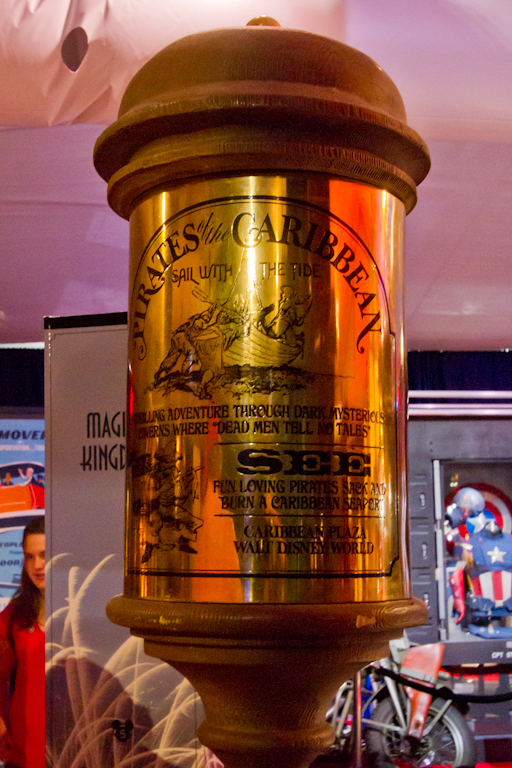 And the sign post from WDW. 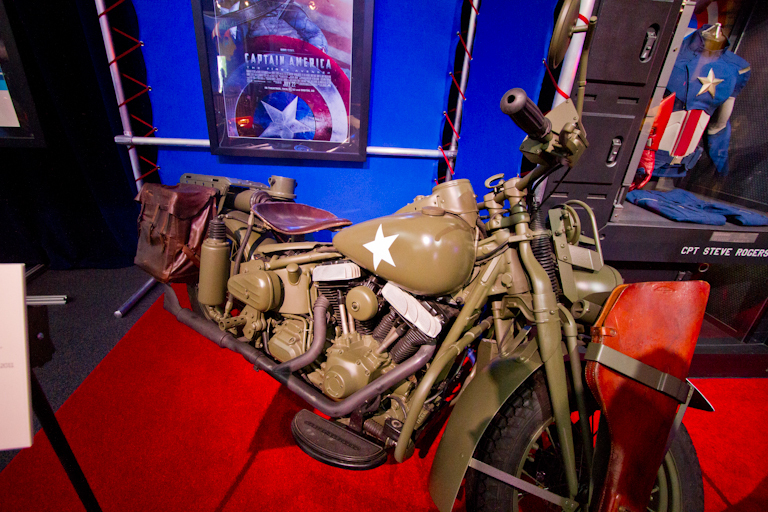 We got to see some great items from cool Disney movies and rides, but there's even more stuff to see! We'll continue again in part 3. 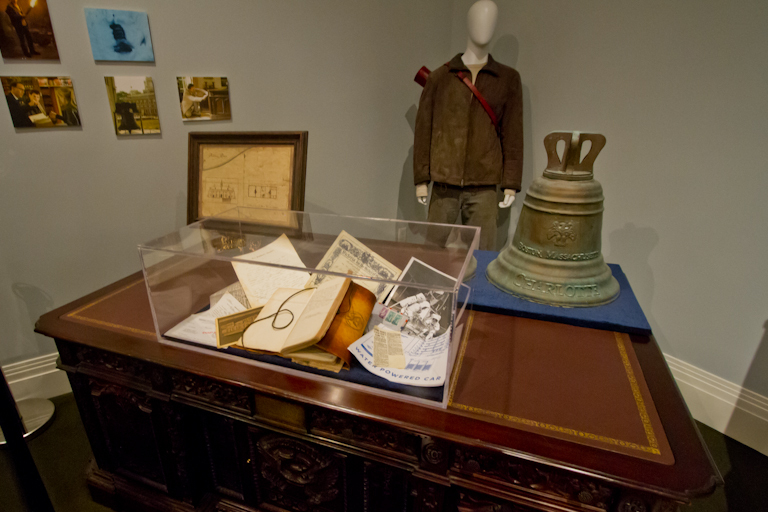 The seal in Walt's office was probably a souvenir he brought back from his Alaska trip. Seals were also the subject of the first True-Life Adventure film called Seal Island. 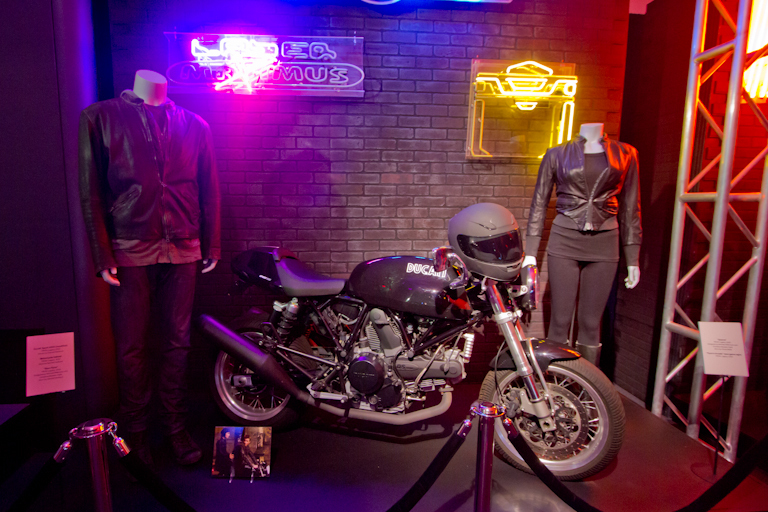 Great photos of the office! 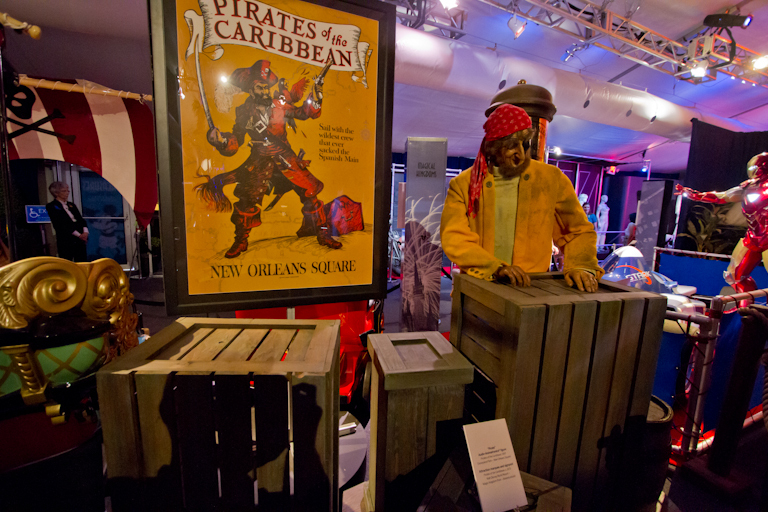 Continuing our exploration of the Treasures of the Disney Archives exhibit at the Reagan Library, we next saw quite a few items from the Pirates of the Caribbean movies. 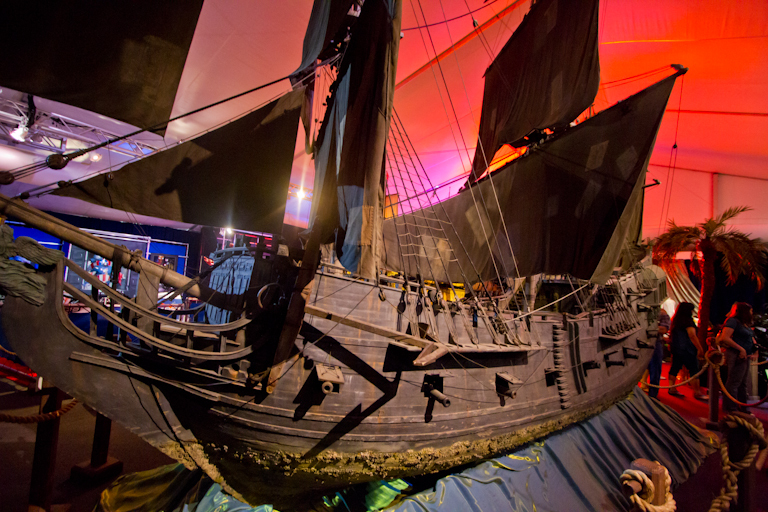 The Black Pearl's Maiden Head. It's a pretty huge model. 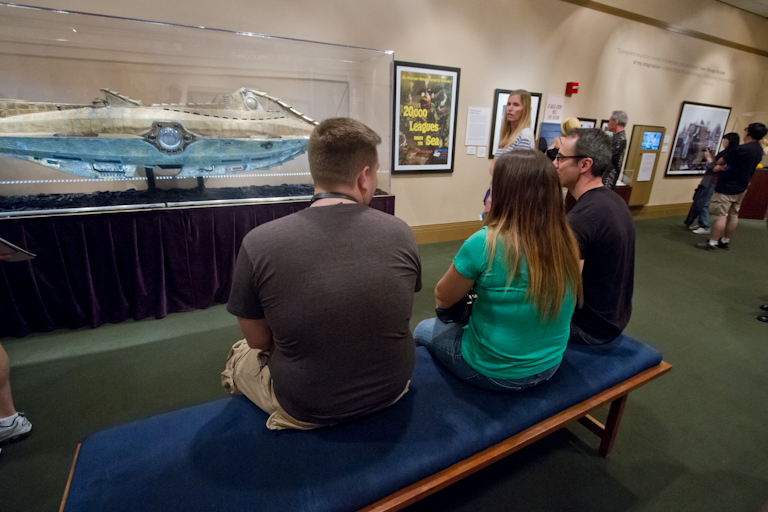 This 26 foot long, 23 foot high model was used in the movies during the special effects scenes. 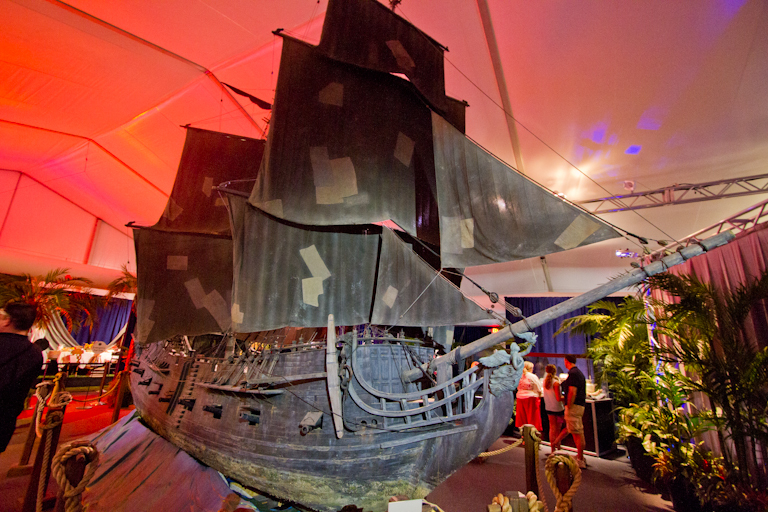 The HMS Endeavour used in Dead Man's Chest and At World's End. 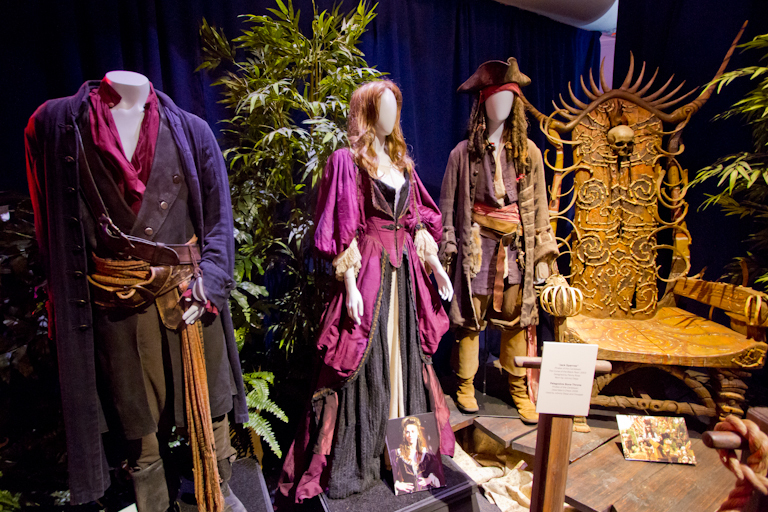 Here we see the screen used costumes of Will Turner, Elizabeth Swan, and Jack Sparrow. Sorry, that's Captain Jack Sparrow. 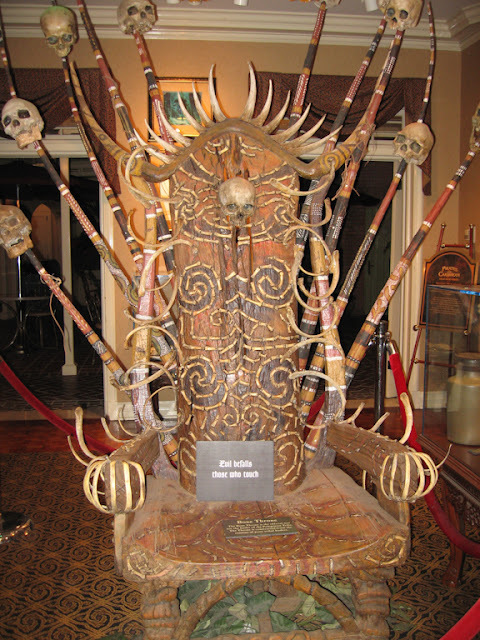 In the back we see the bone chair from Dead Man's Chest. We've actually seen this chair before back in 2006 when it was on display in the Disney Gallery above Pirates of the Caribbean (now the Disney Dream Suite). 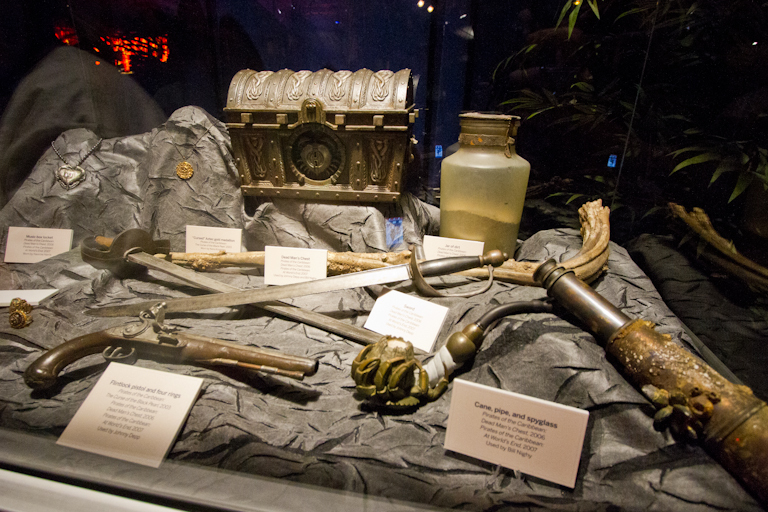 There were lots of screen used props in this display case, including the chest that held the heart of Davy Jones, the jar of dirt, Captain Jack Sparrow's sword (that I almost expected to be made of wood), and the pistol with just one shot. 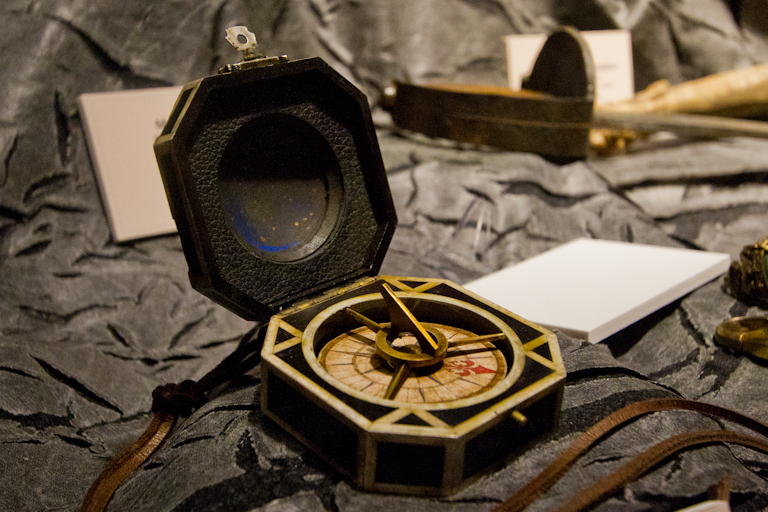 Also we got to see the compass that doesn't point north. 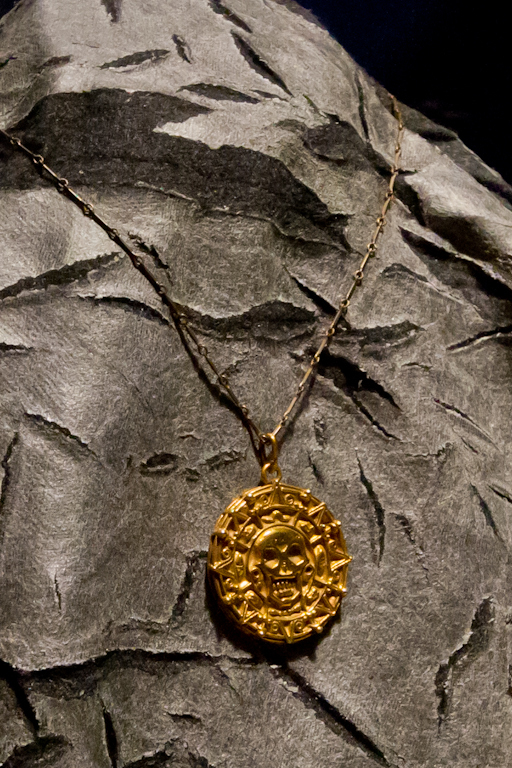 And the pirate medallion that Elizabeth Swan kept. Finished with the outside tent, we headed back inside. 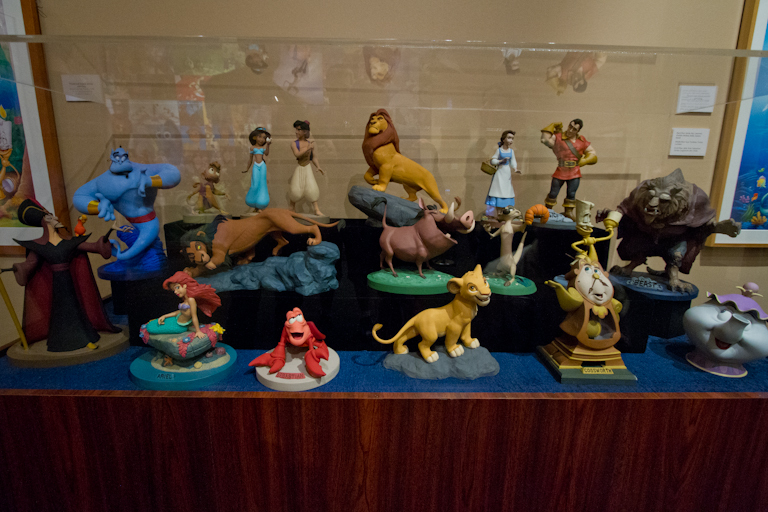 These maquettes pay tribute to some great Disney characters. When Ruston asked "If you could have just one of these maquettes, which would you choose?" I decided I would pick Beast. Cogsworth was also a popular favorite with our group. 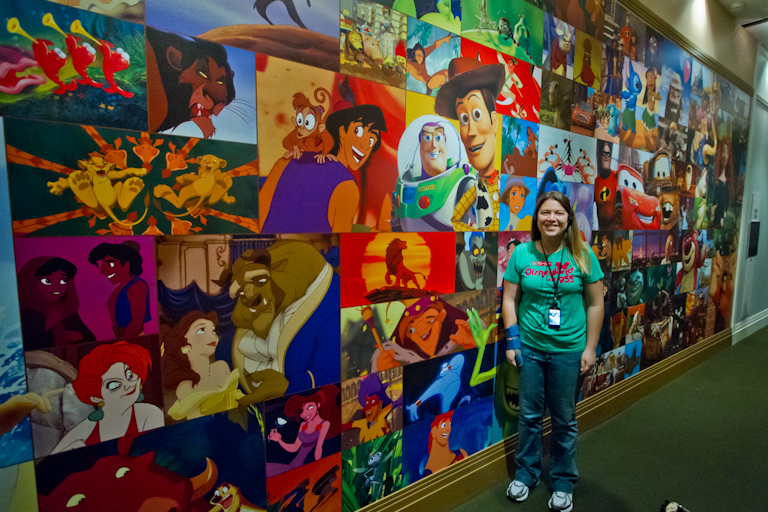 On the opposite wall are a bunch of our favorite characters. 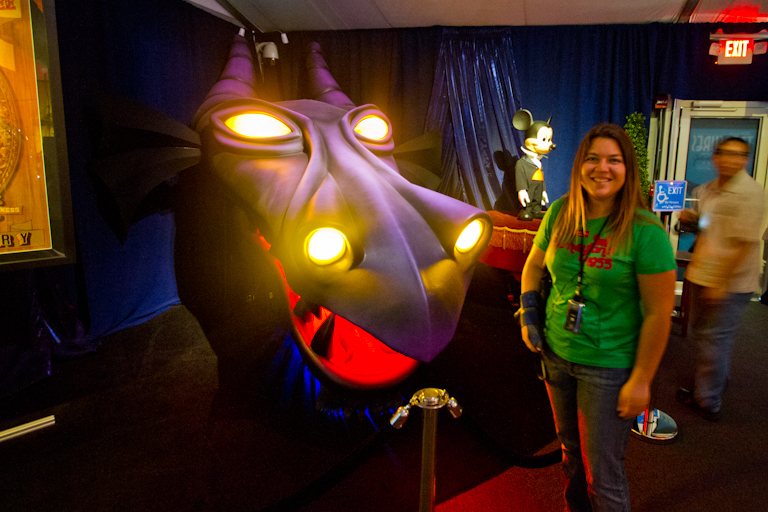 I was happy to see my favorites Hercules and Hades represented. Theresa found Rapunzel as well. Theresa deliberately posed like this in front of Mike Wazowski because he never gets his picture right on magazines or TV commercials. 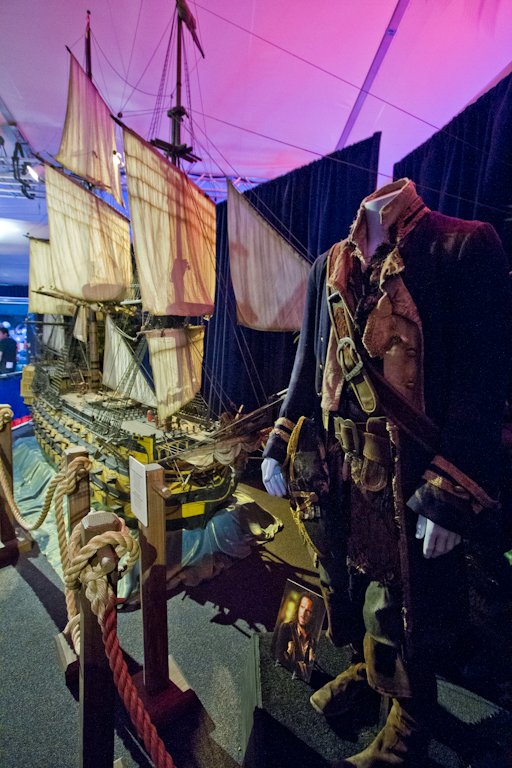 The last display paid tribute to National Treasure 1 and 2. 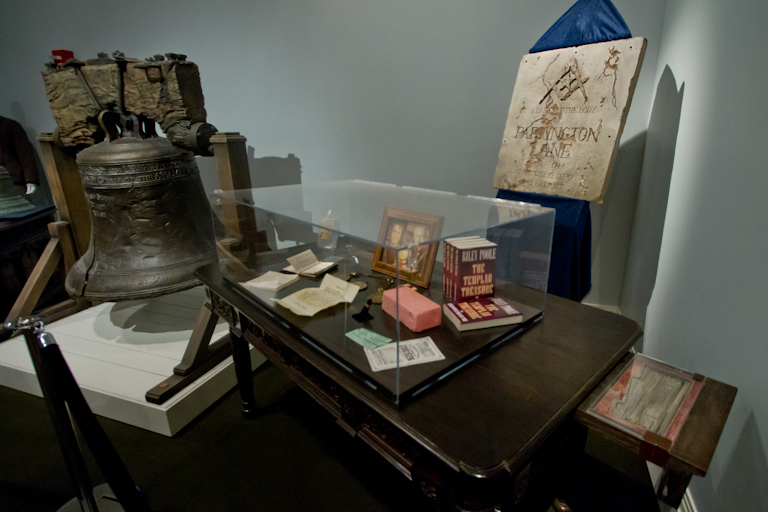 There were lots of fun things to see from the movie, including both of the Resolute desks. 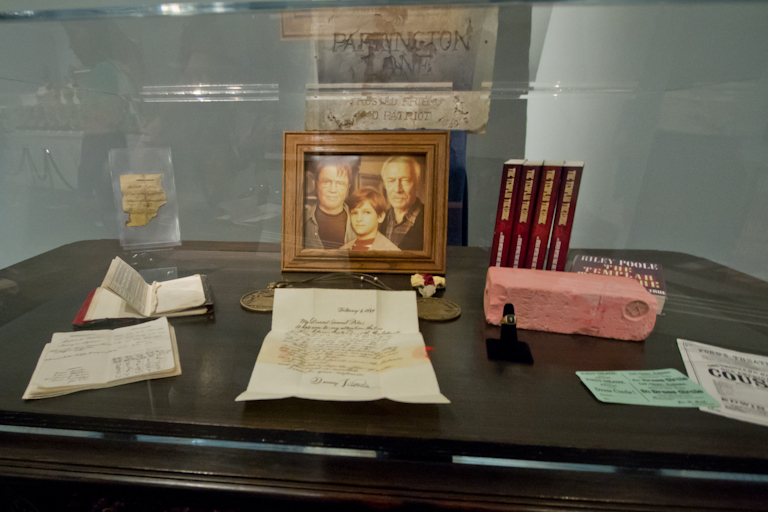 Various paper props from the movie, plus Riley's book, and the Free Mason brick where they found the Ben Franklin spectacles. 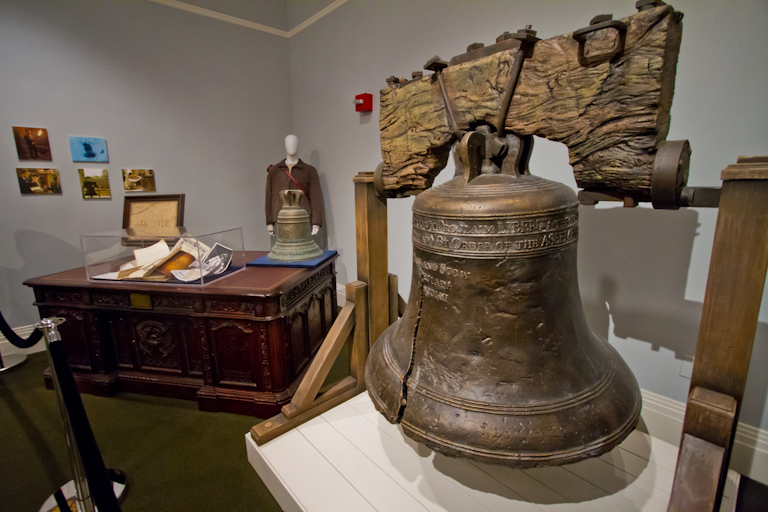 A model of the Liberty Bell. 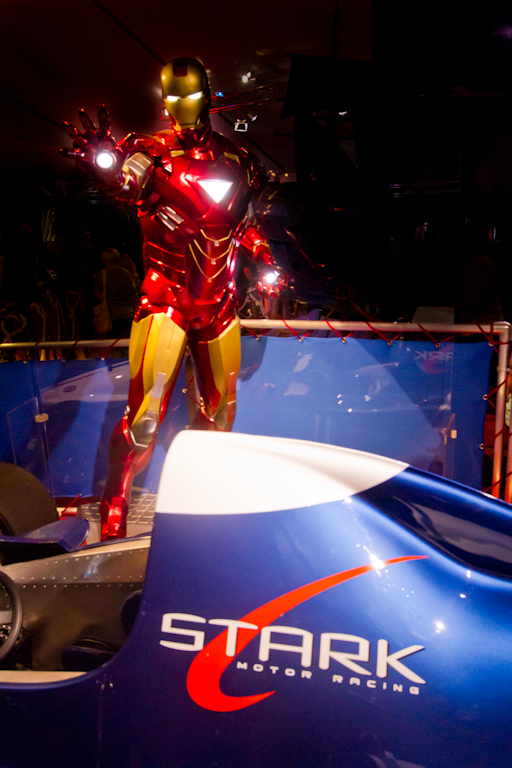 We actually saw the original in Philadelphia last year. 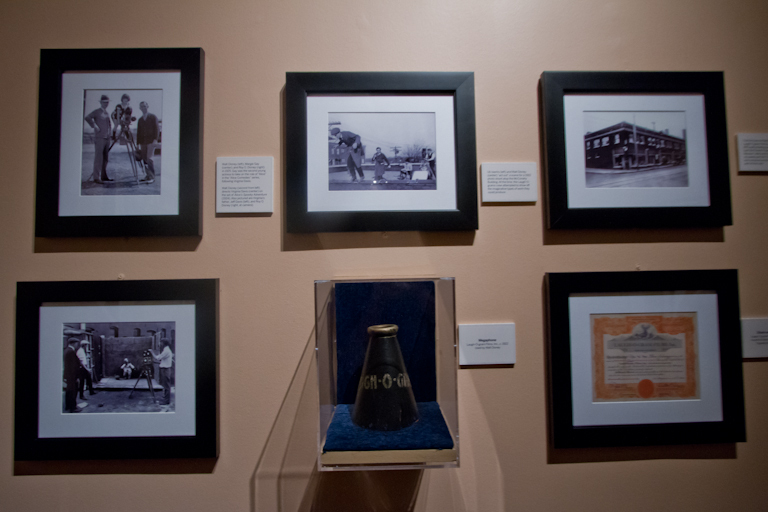 More props from the movie, Nicholas Cage's costume, plus the bell from the Charlotte that kicked off the rest of the crazy adventures. 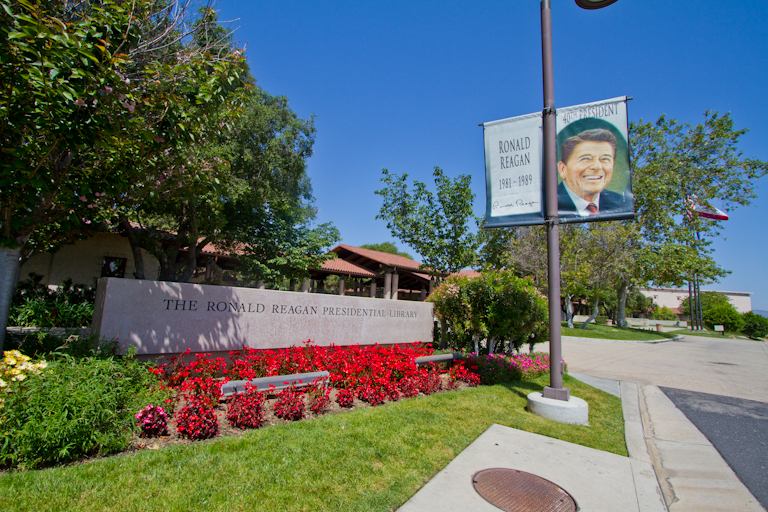 The final room showed all the connections between Walt Disney and Ronald Reagan. 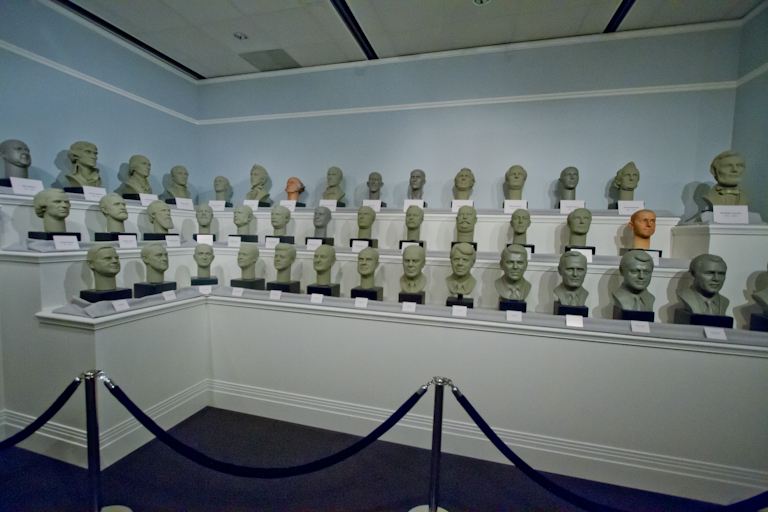 Busts of the US President's carved by Blaine Gibson, for use in the Hall of Presidents at WDW, Theresa's favorite place to take a nap when we're at Disney World. A close-up of our 40th president. 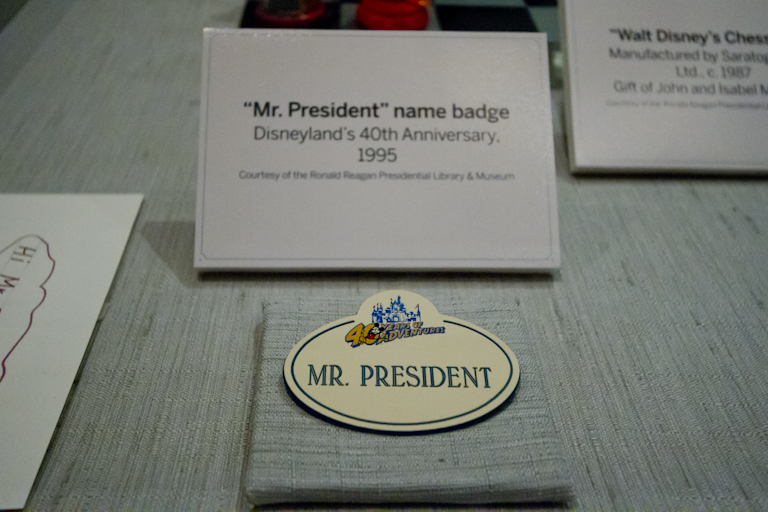 When Ronald Reagan re-visited Disneyland for the 40th anniversary (remember he was actually there on opening day), he received his own name badge. 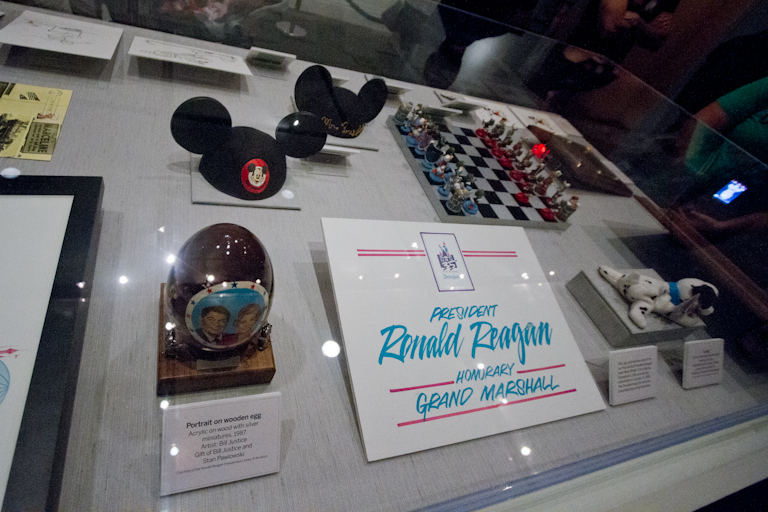 He even had a personalized Mickey ear hat that said Mr. President. 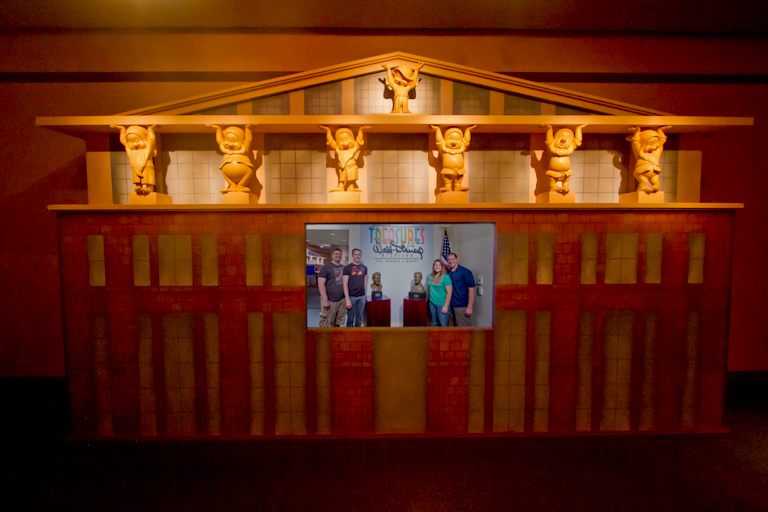 As you leave the exhibit, there is a model of the Team Disney building from the Disney Studios in Burbank. Check out the photo after this one or click here to read about our visit there. 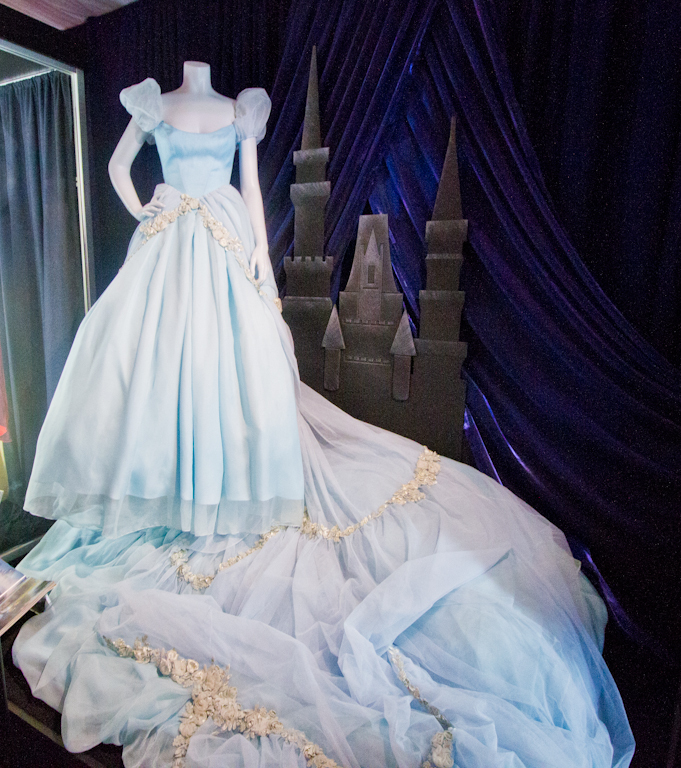 On the TV in the center there was a tribute to various Disney movies and TV shows. I liked our picture better than any of those though. 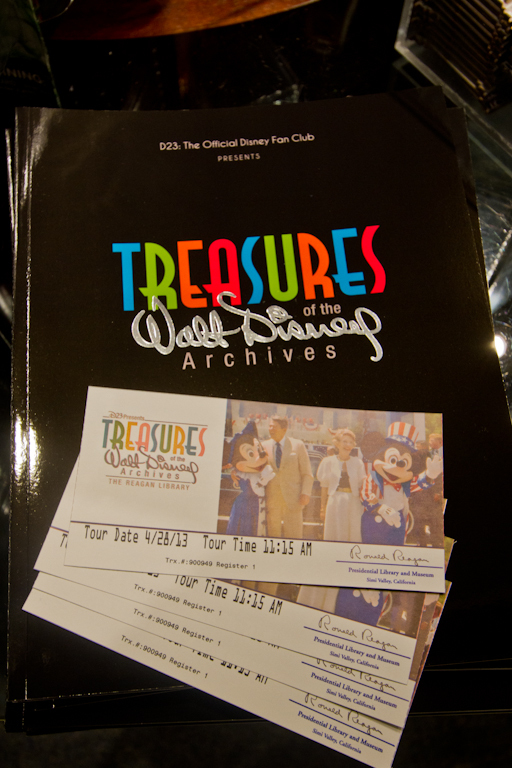 The Treasures of the Walt Disney Archives was another great trip for the four of us. 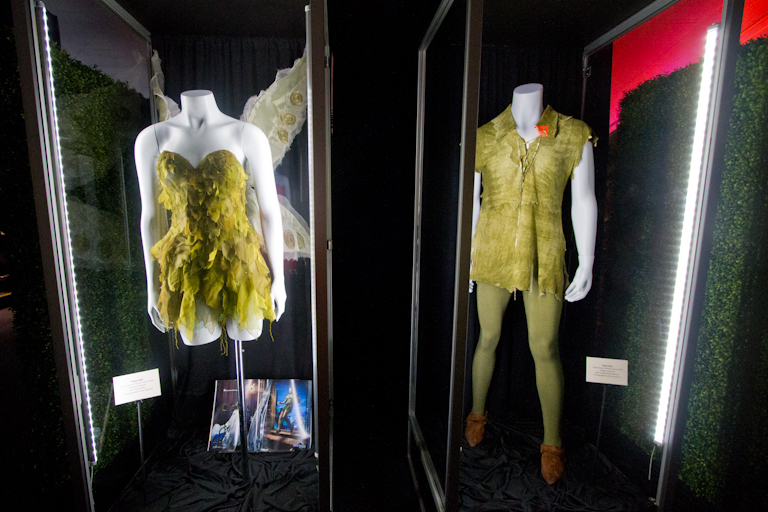 It was great seeing all that classic Disney history. 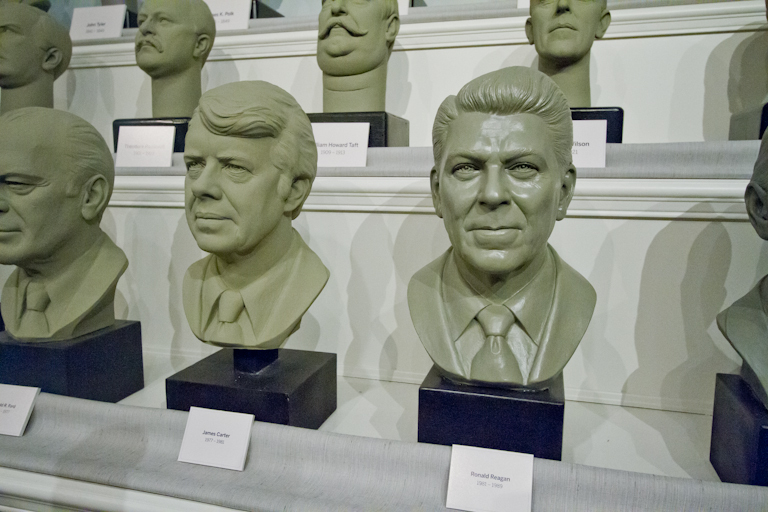 Next up, a quick trip through the Reagan portion of the Reagan museum. Very nice photos. 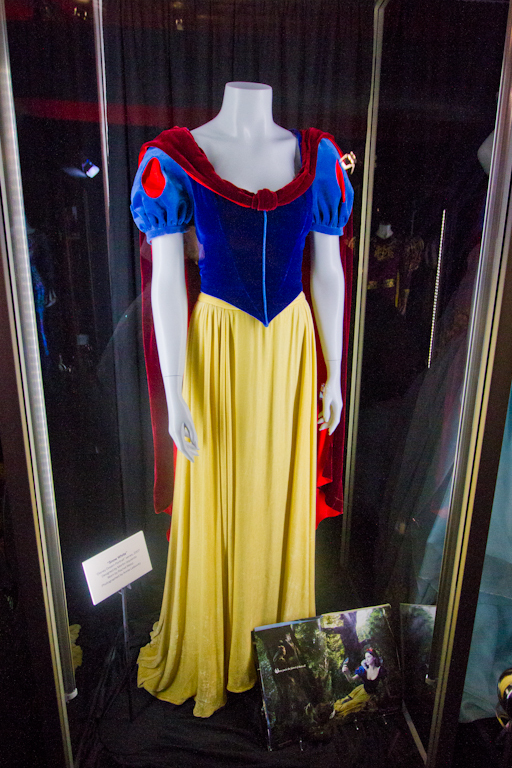 I really enjoyed seeing this exhibit, myself, especially all the "classic" Disney stuff. 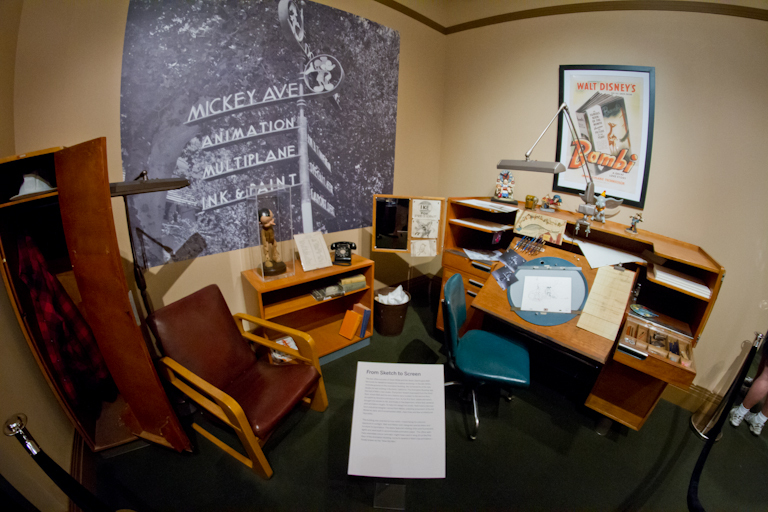 I still miss seeing Walt's office when it was on display at Disneyland. Thanks for sharing. fantastic! 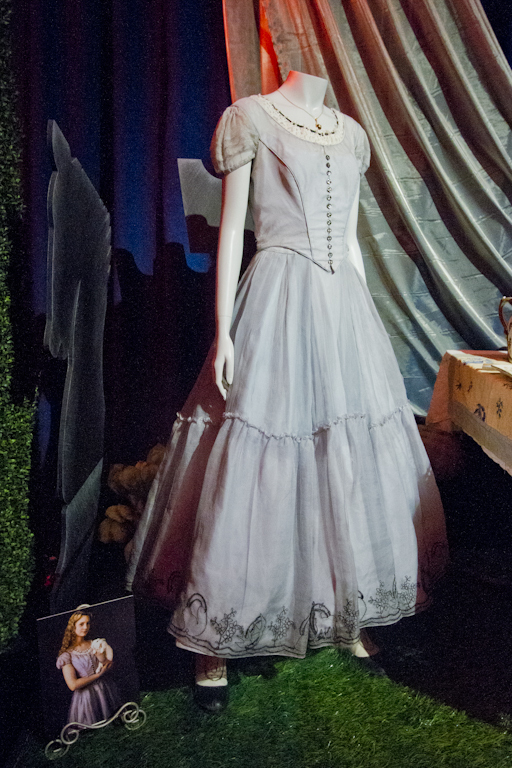 i love costumes and props and the history surrounding everything in between!